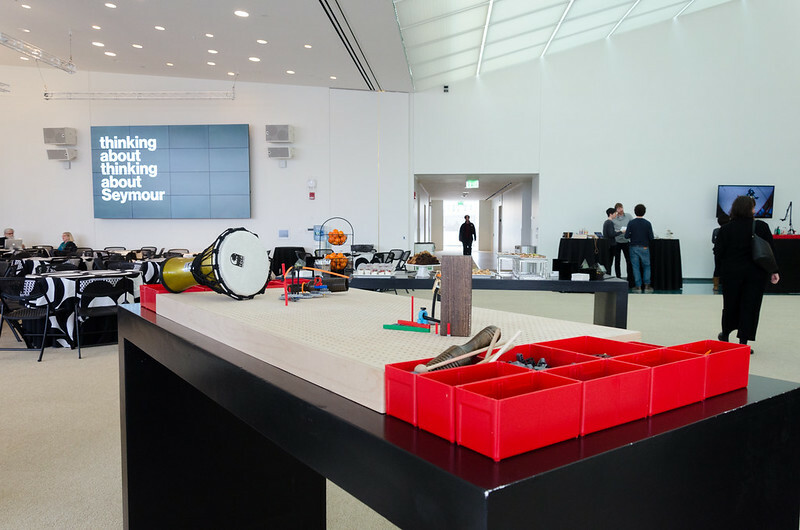 Last week, the Tinkering Studio team traveled to Boston for a symposium celebrating the life and works of Seymour Papert at the MIT Media Lab. Seymour Papert was a revolutionary educator who designed the logo turtle, taught creative computing, and wrote many seminal books including the classic Mindstorms. 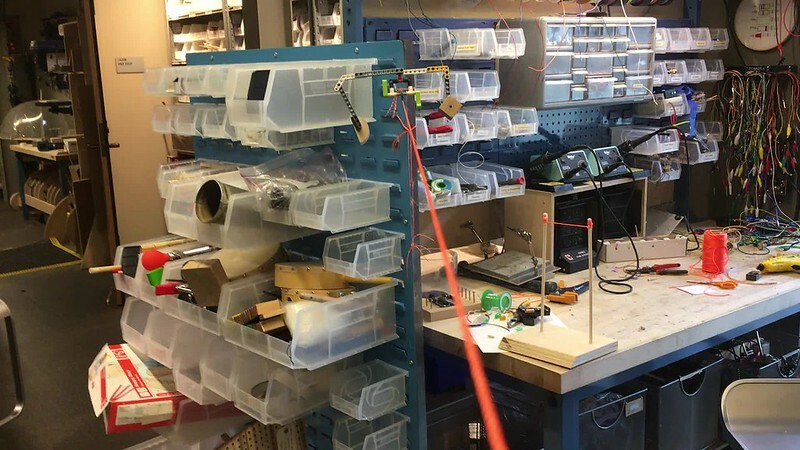 His constructionist theory of learning, emphasizing collaboration, iteration, and agency, has formed the foundation of our work in the Tinkering Studio and has deeply influenced the entire maker movement. The event featured many of Seymour's close colleagues, friends, and mentees who shared big thoughts and personal anecdotes in a series of keynote speeches and panel discussions. And since an event celebrating someone who advocated tinkering and play wouldn't make sense without a hands on exploration, we set up some stations where people could try out a sound machines activity that we've been developing with the Lifelong Kindergarten group and the LEGO Foundation. In the prologue to Mindstorms, Seymour focused on how, as a child, he fell in love with gears, and that love for a material changed his self-perception and allowed him to become more interested in learning about math, science and engineering. 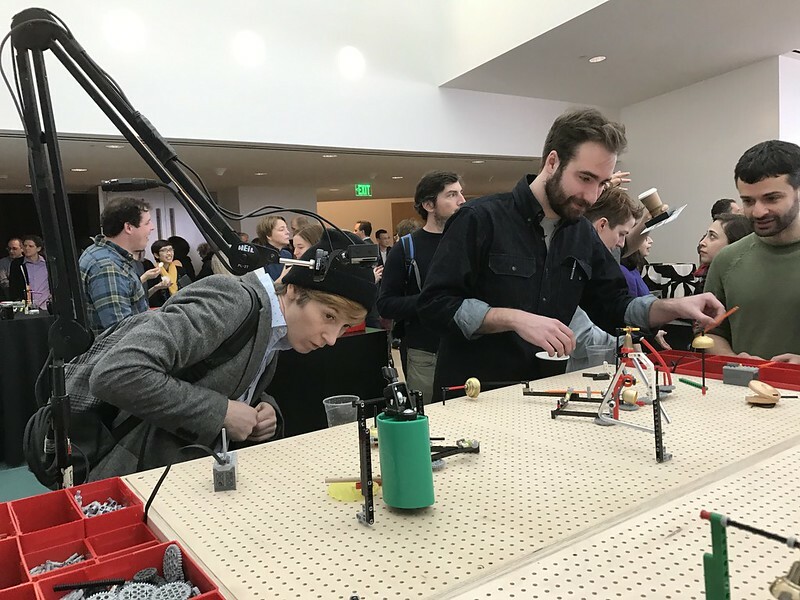 So for the event we thought it would be appropriate to try to emphasize gear-based sound machines by creating five pegboard tables where people could work together, using the LEGO gears to expand their constructions. Seymour's work also focused on the powerful ideas that can emerge when playing with programming and computation. 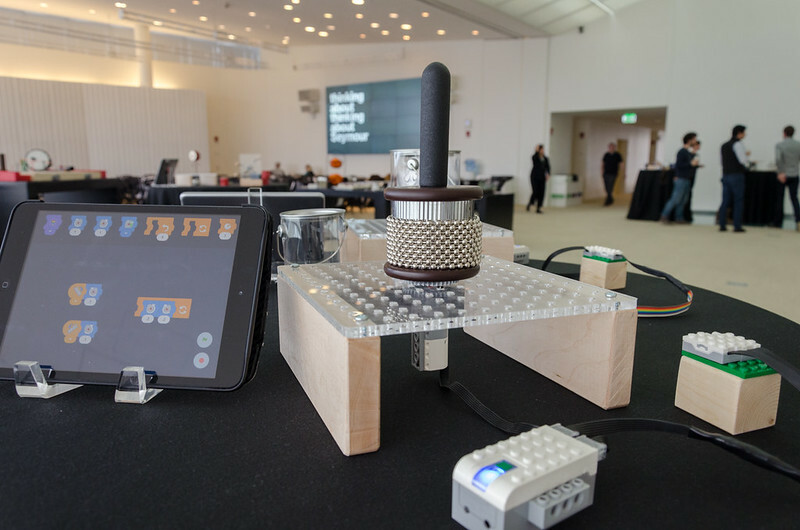 LEGO sound machines lend themselves to these types of explorations and we set up several tables with interesting shakers, music boxes, and "cows in cans" that made different sounds when programmed using a version of Scratch on an ipad controlling a WEDO motor and sensors. This combination of sound machine stations created a joyful cacophony of bells, drums, and shakers that was audible as people got off the elevator and joined the event. The large working spaces also encouraged collaboration and we could see ideas quickly spread around the working spaces. It was great to see learners of all ages experimenting and working together to create interesting rhythms and complex constructions. Some of the participants came back to the stations at each break to keep working on their ideas and testing out new ways of building. 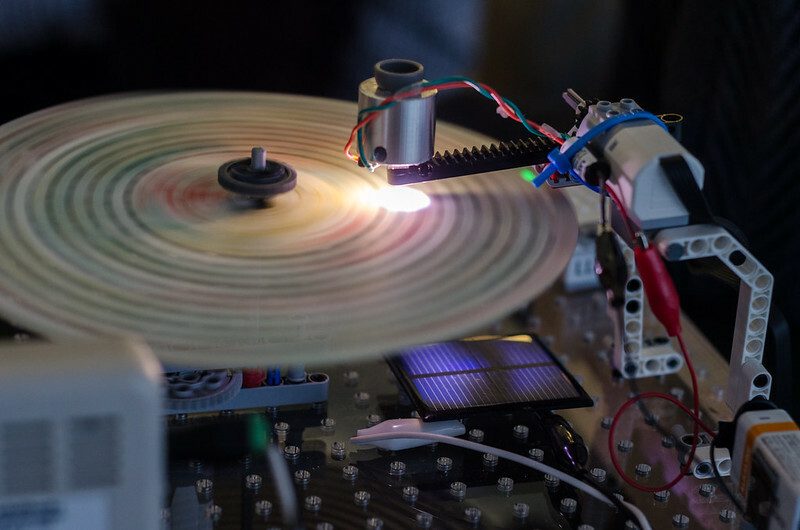 Sebastian worked on one of the most compelling programmed instruments that included a disc with holes, a bright LED, a solar panel and a speaker. When the light passed over the solar panel in an off/on pattern it created a frequency that could be heard over the speaker. Programming the motor to move the light back and forth over different parts of the disc made a changing tone that sounded pretty amazing. This and other interesting examples really demonstrated the high ceilings possible when combining LEGO pieces with real world sensors and materials. One of the best things about this unique event was that it gave us the chance to invite some of our biggest inspirations, like Eleanor Duckworth, to try out our new activities. It was so cool to be able to reflect together on the activity design, faciliation, and materials with a group of educators and thinkers that we deeply admire. All in all, it was really special event and a great place to continue the prototyping of some of our #LEGOtinkering ideas. We plan to continue to think about how environmental elements can support collaboration, the ways that programming can be more seamlessly integrated into the activity, and which real world materials can support furthered investigations. 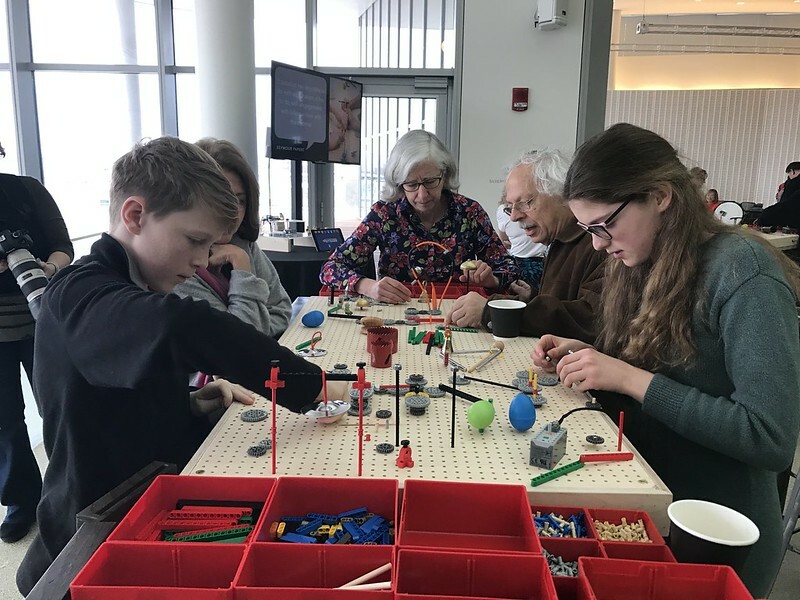 As well, hearing about and discussing the legacy of Seymour Papert also helped to see the context of this activity and the larger Tinkering Studio program as one of the "seeds that Seymour sowed" all around the world. 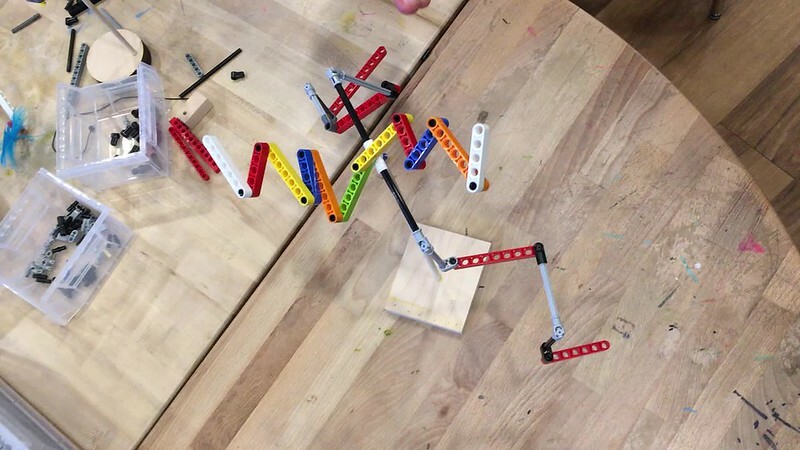 To continue sharing thoughts about #LEGOtinkering balance explorations, I wanted to focus on the initial starting points and prompts that we tried out for the activity. One thing that we all appreciated about the balance workshop was the low threshold to entry. There were no complicated battery packs and motors to explain initially, and the idea of balancing an object on a point is nearly universal. Much younger kids could get involved and excited about the activity. When introducing the activity, we often began by asking participants to physically feel it balanced on their finger letting them get engaged with the objects in a different way than other activities. Additionally, we build several types of stands, but something that they all had in common was that they allowed people to see what others were making by elevating their works-in-progress off the surface of the table. 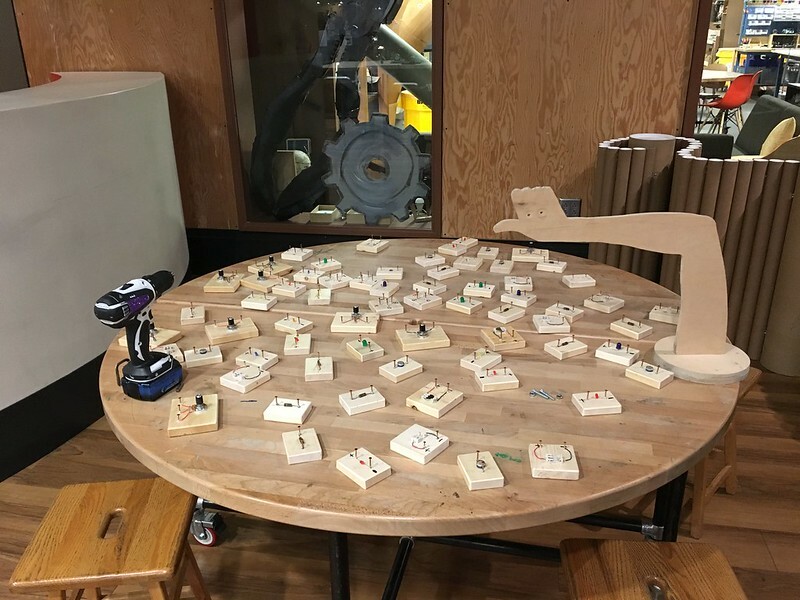 In all tinkering activities we feel that it's often important to be able to borrow ideas from others sitting around the table and the stands make that easier in this case. However, one question that we had about the initial prompt was what might happen if we switched from 'can you make a balancing object?' to 'can you build a kinetic scupture'. Although we appreciate when activities allow for an early success, we don't want that moment to be the end of people's explorations. In several participants we noticed a feeling of 'doneness' once they accomplished balancing an object on the stick for the first time. 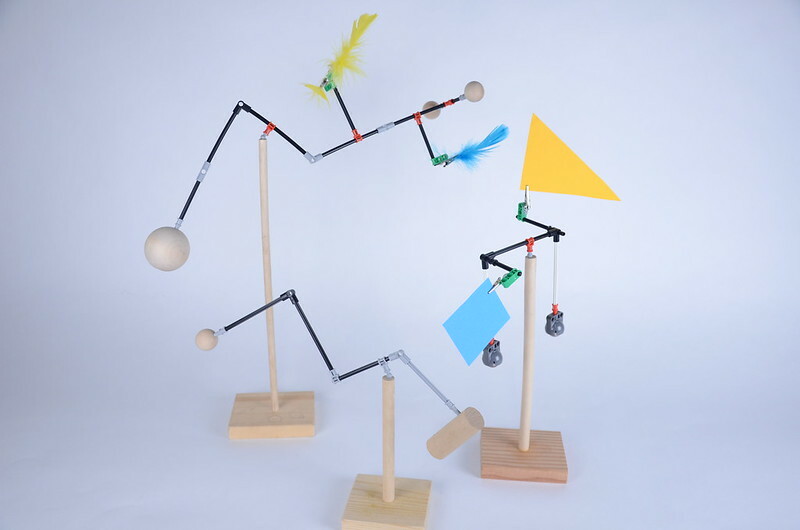 Maybe shifting the emphasis to building a kinetic sculpture would encourage people to work on the movement, precariousness, or unexpected qualities possible in the creations. Additionally, we think the initial set of examples can go a long way towards encouraging wide walls and complex creations if they are varied and demonstrate different aspects of the phenomena. While I don't think we got to a perfect set of examples these are a few ideas of ones that we felt were the most generative. While specialized parts like the tripod axle piece or the little truck hitch provided good initial starting points when paired with other axles and joints, we also wondered if they took away from some of the exploration by creating too compelling of a place to build off of. 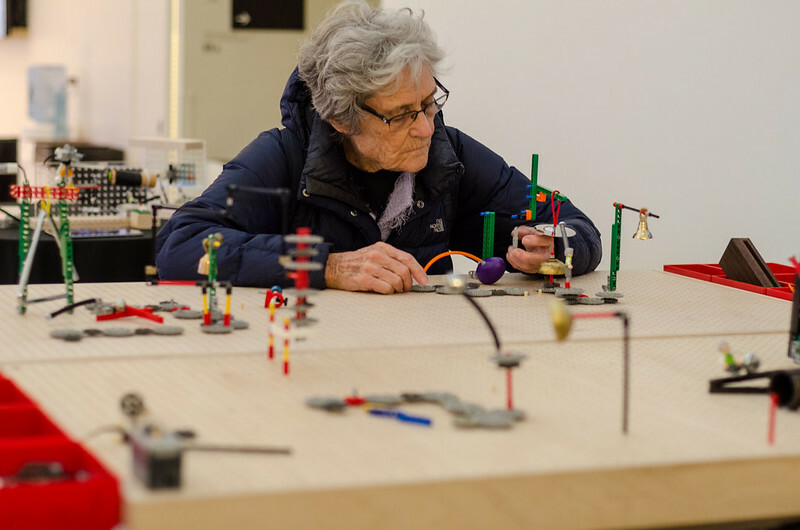 In some of our original balance activities, some participants could work on making a sculpture and then find the point where the object balanced with offered another way in. There's probably no right answer, but it's interesting to look at the way that the first steps define the rest of the experience. If you try out #LEGOtinkering balance explorations, please let us know what set of materials and initial starting points seem to work the best for the activity. 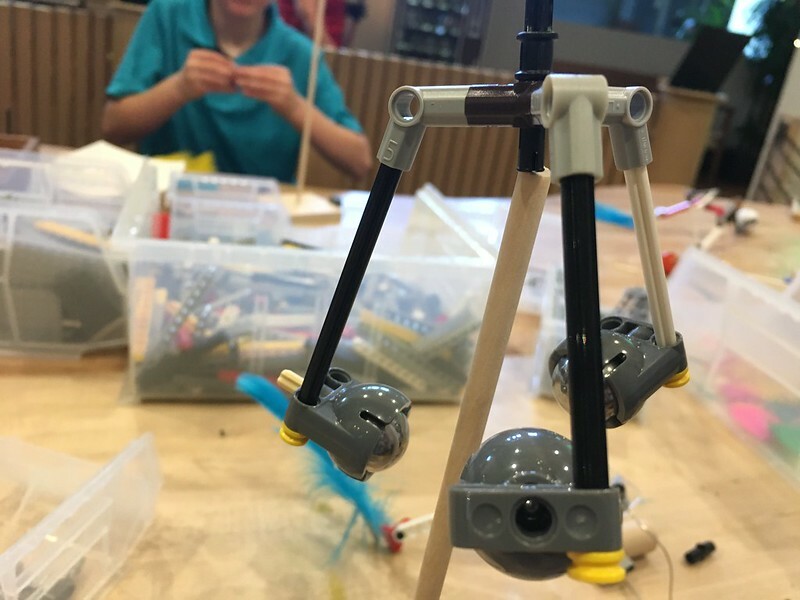 Over the past few months, we've been prototyping a tinkering activity using LEGO pieces to construct balancing sculptures. We're currently putting the idea on hiatus for a while as we prepare for an upcoming LEGO event, but we thought that in lieu of posting a detailed instructable about how to do the activity, I'd write a couple blog posts to share our groups reflections so far and the questions and ideas we're excited to pursue when we return to this topic. The first most important thing about the activity is the relationship between the LEGO parts and other real world materials. 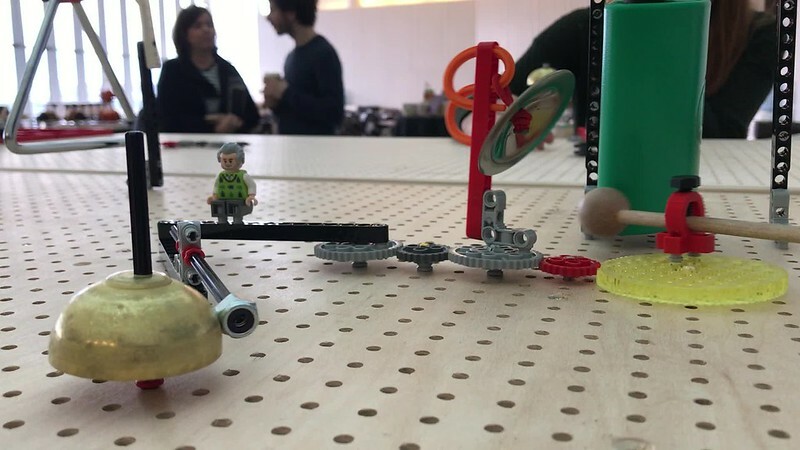 As in the other activities that we've tried with LEGO, we think that using everyday materials helps people feel more connected to the projects and lowers the barrier to entry. With making balancing objects, there's another reason, as LEGO pieces are all fairly light, adding on heavier pieces made of wood and metal provide opportunities to explore more extreme examples. 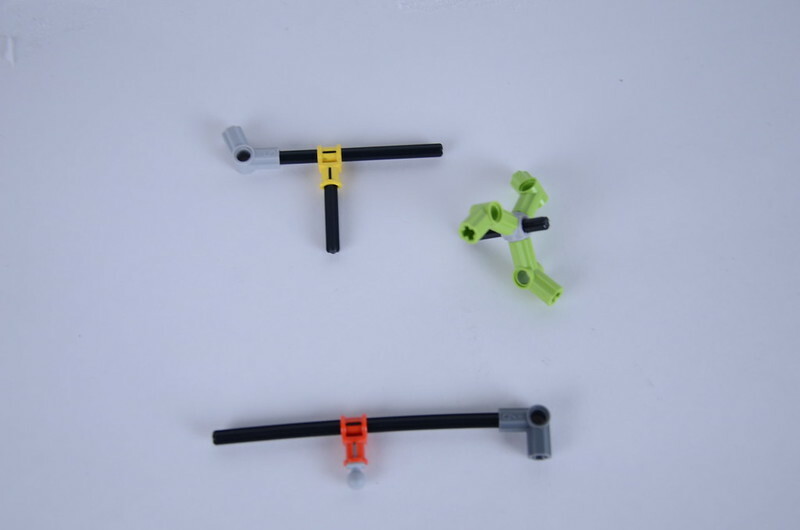 We experimented with several ways to make these objects LEGO compatible and ended up settling for probably the most straightforward means of connection. We took the objects and used a #12 drill bit to make a hole in them to make them compatible with the technic pins. We also thought a lot about what types and numbers of extra items to use with the set. 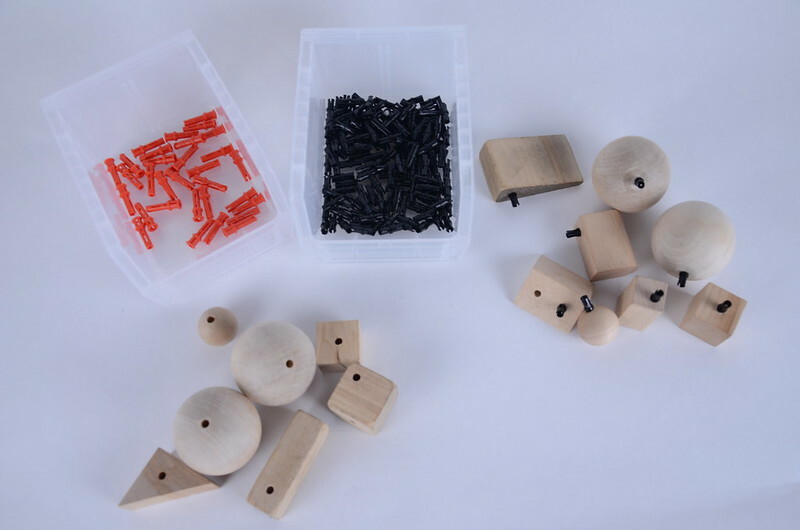 As we identified parts to use in the prototyping, we were more drawn to natural materials like wood, metal and paper that had a variety of weights. We wanted to pick out geometric shapes and other aesthetically pleasing objects that contrast and mix well with the color and plastic of the LEGO parts. It felt like a good thing to have multiples of each one so that participants could test out the weights in a more systematic way. 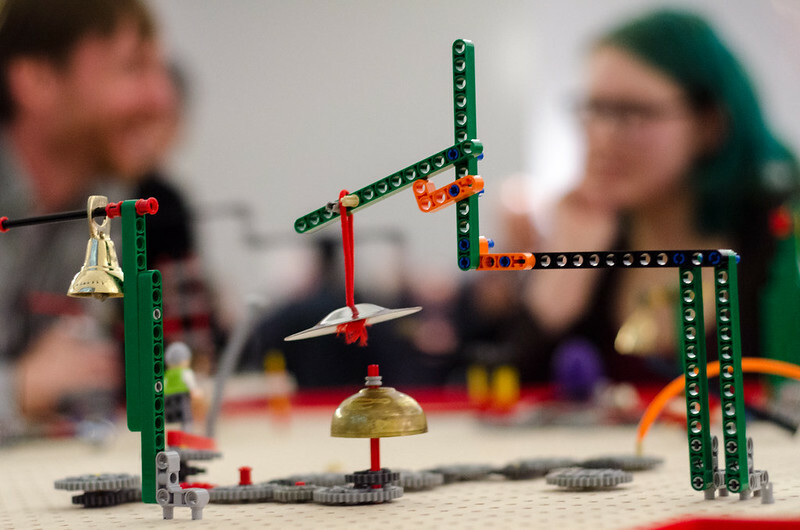 This pointed to something that we liked about this activity (as well as the other LEGO tinkering workshops), the ability to use the LEGO system to iterate on ideas, make small changes, and revert to previous versions of creations. Its a big shift from other materials that we've experimented in the past to make balancing objects like wire, corks, glue and feathers where people could easily make evocative pieces, but it was far more difficult to chance them. Unlike the sound machines and art machines however, with balance we found out right away that because of the precise and tactile nature of the phenomena, sometimes moving one hole space felt too much. We began to experiment with alternate materials sets which emphasized sliding the weight on the axles to create minute changes. In the next post, I'll share about some of our starting points and examples in this line of prototyping that seemed to be the most generative. 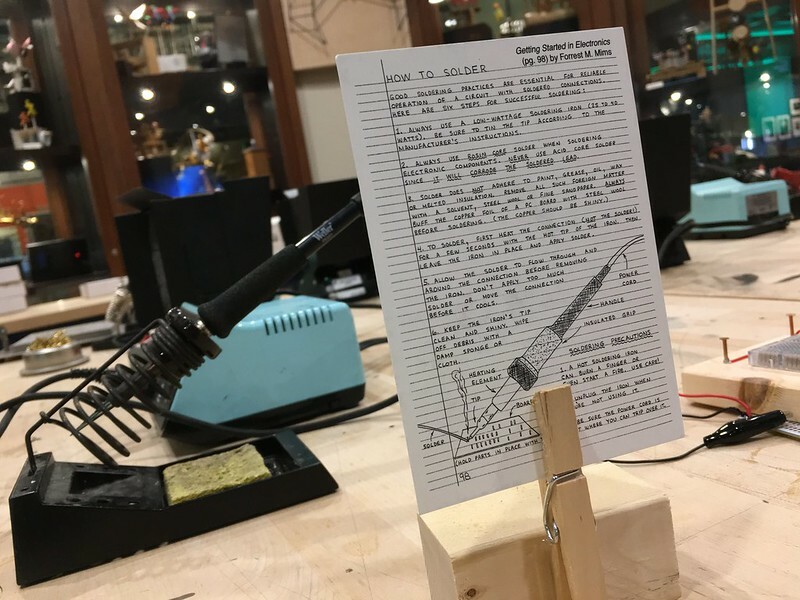 Last week we hosted a Tinkering Social Club event with engineer and designer Star Simpson who created physical PCB versions of the delightful sketches of Forrest Mims III from his 'getting started with electronics' guides. 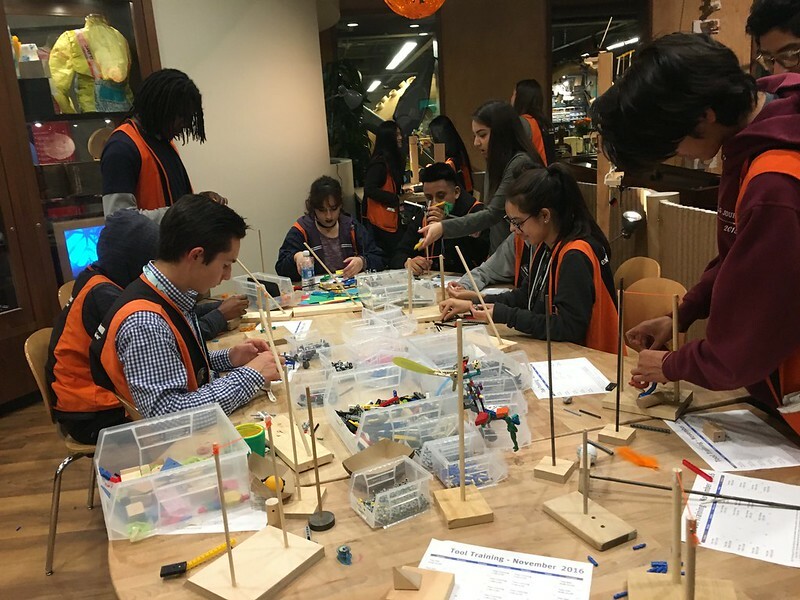 For the event, we thought that we could provide several different experiences for adults to feel more comfortable with elements of electronics and engineering. These topics can sometimes feel intimidating and we think that elements like the Circuit Classics can make them feel a little more friendly. 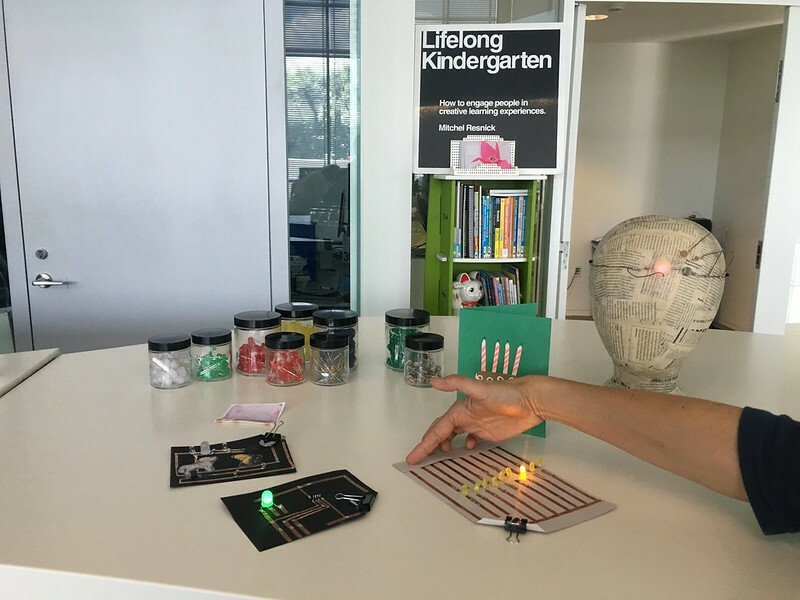 In the space we set up a small table with a different version of our circuit board activity focused on components like LEDs, resistors, and light sensors. We thought that this station could be a place for initial explorations and low stakes testing out of ideas. We also scattered a couple of artistic interpretations of Forrest Mims' circuits that Nicole has built over the past couple of years around the studio environment. 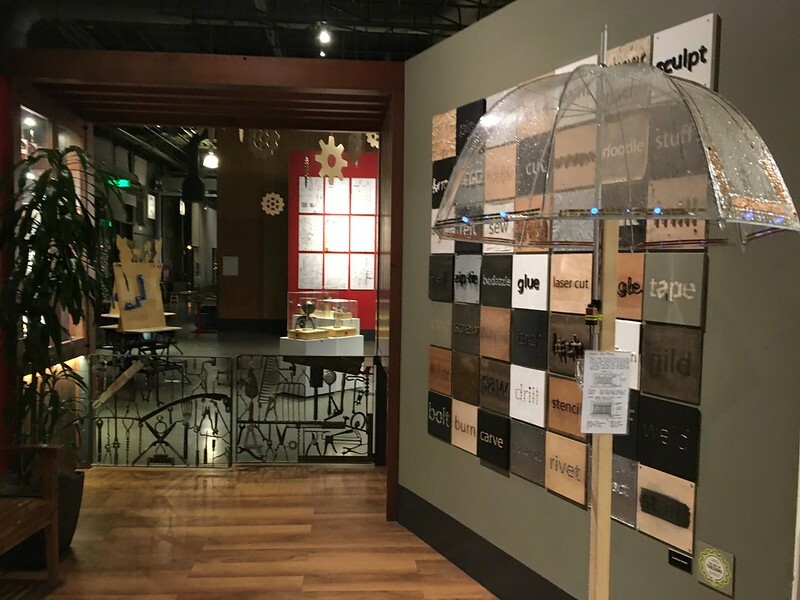 One is a rain sensing umbrella that turns on blue LEDs when water connects the copper tape leads and another is a tounge-in-cheek fire alarm that goes off when a candle positioned inside a clothespin melts from the flames. 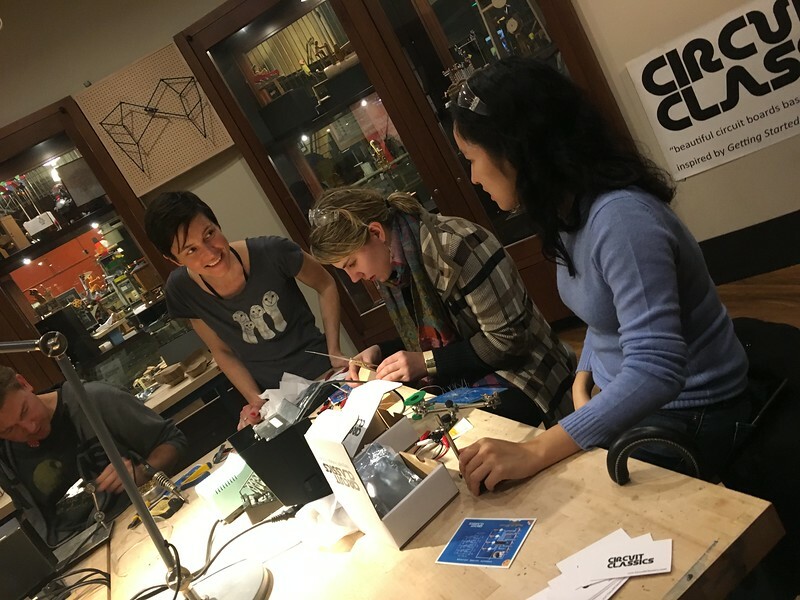 And in the center of the tinkering studio, we set up three soldering stations for visitors to try to collaboratively assemble the Circuit Classic boards. We had all three examples (stepped tone generator, dual LED flasher and bargraph voltage indicator) which each had a different selection of resistors, capacitors, switches and LEDs to attach to the board. 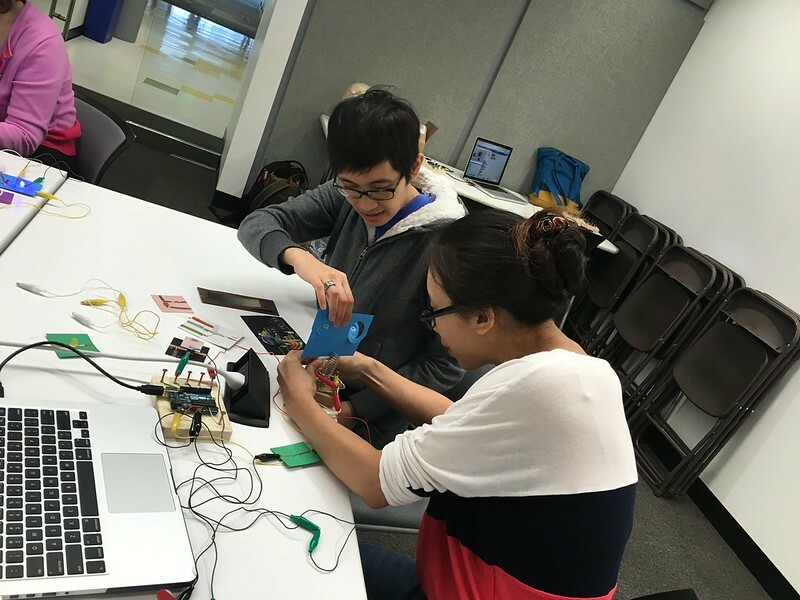 For many participants in the workshop it was a first chance to use a soldering iron, so it was fun to see them gain confidence in their abilities as they added more elements to the boards. There were also a lot of great conversations and friends sharing knowledge with each other as they assembled the parts and quite a few people commented that this was something that they didn't think that they could do based on their previous experiences. As well, it was great to have Star on hand to share her expertise about the boards and the design. After they were built, we were able to start experimenting with the circuits and being playful in our investigations of adding colored lights to the boards or testing resistance by holding hands. In the past, we've shied away from introducing circuits or soldering through breadboarding as we're afraid that it may seem too technical or people may perceive it to be just for engineers. 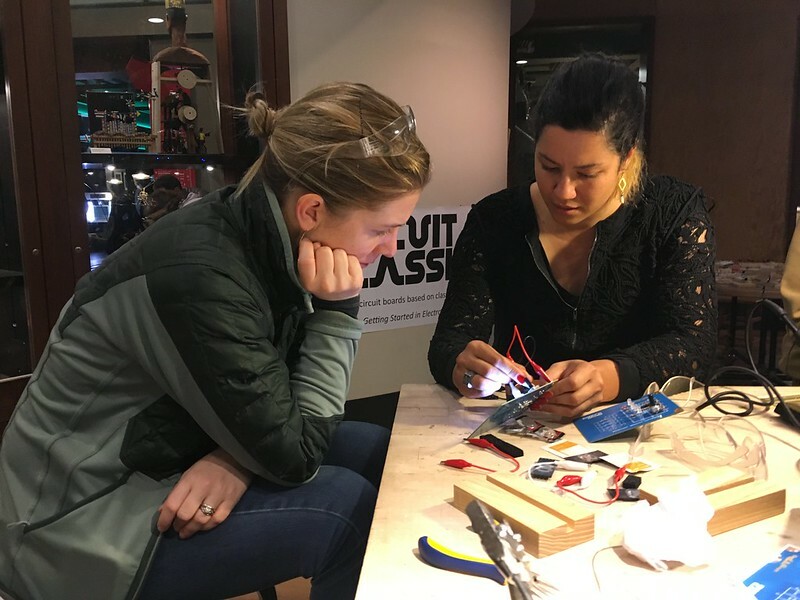 While I think we're still very much interested in alternative and unexpected teaching tools like copper tape or conductive thread, something about this event made me reconsider the possibility of re-framing more traditional tools. Having these friendly looking blue boards and inviting a maker in to help people begin to understand these concepts proved to be a great first start. Additionally, the social environment of the tinkering social club allowed for a more collaborative introduction to these topics which hopefully can start to make people feel that they are capable of learning more. We're looking forward to new experiments for future workshops and events. 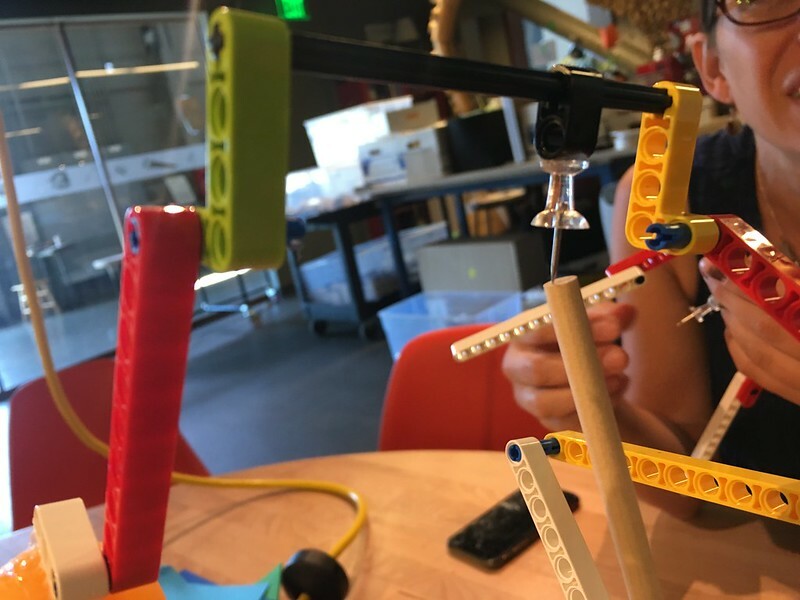 Since our #LEGOtinkering balance workshop at East Bay Maker Faire, we've been continuing to test out ideas and try new things around the phenomenon of balance using LEGO pieces with visitors to our Tinkering Studio workshop. I wanted to share a few of our more recent experiments as well as raise some questions that we still have about how to best support tinkering through this activity. Our first prototypes centered around creating objects that balance on a single point, but we've tried building objects that move along a path. These creations tend to be a little more complicated and tricky to get going, but there's something really satisfying about creating a moving object. Many of the same principles apply to the exploration of balance in terms of making elements with a low center of gravity to keep them stable on the line. 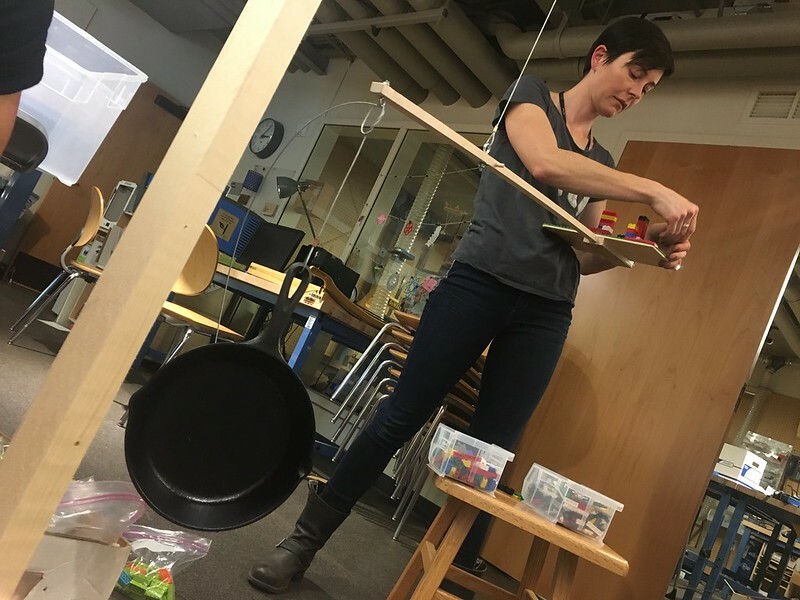 We set up a makeshift 'zip-line' in the learning studio to test out their creations and we also built some individual stations for testing on a short piece of string. 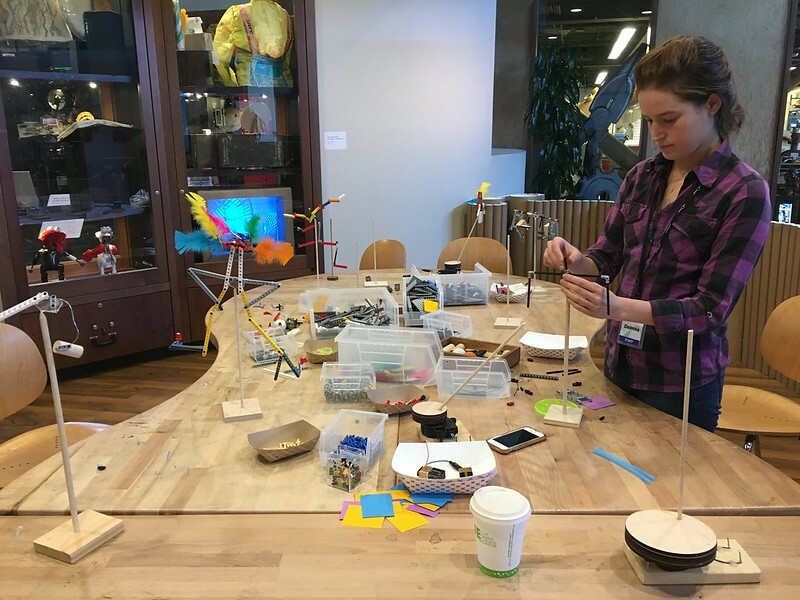 After some initial prototyping, we created a testing station in the tinkering studio for participants to try out building their own moving models. We thought that it would make sense to try to add soem large and light materials like paper shapes and feathers to see if they could spin and twirl as the LEGO vehicles move down the line. 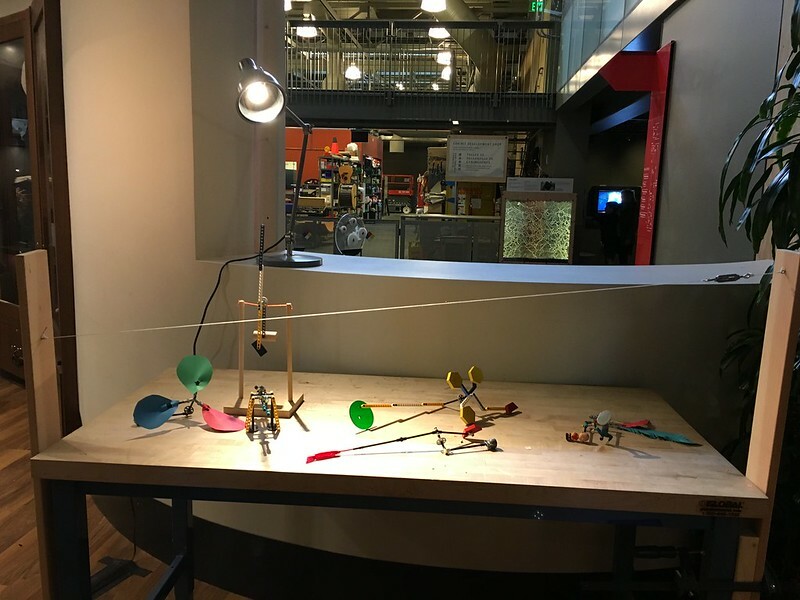 In addition to the zip-line table we set up the balancing tree from maker faire in the workshop with a spotlight projecting shadows to create two dramatic environmental pieces for displaying examples and showcasing visitors' creations. We thought that it could be interesting to try out a workshop where participants choose or cycle between the two different balance explorations. Kids and adults made some pretty interesting creations to test on the 'zip-lines' with moving elements. It seemed that having the extra options allowed kids to go a bit deeper in the investigations and added more of a high ceiling to the workshop. As well the shared testing space created more opportunities for collaboration and social scaffolding as participants watched eachother try out their balancing sculptures. 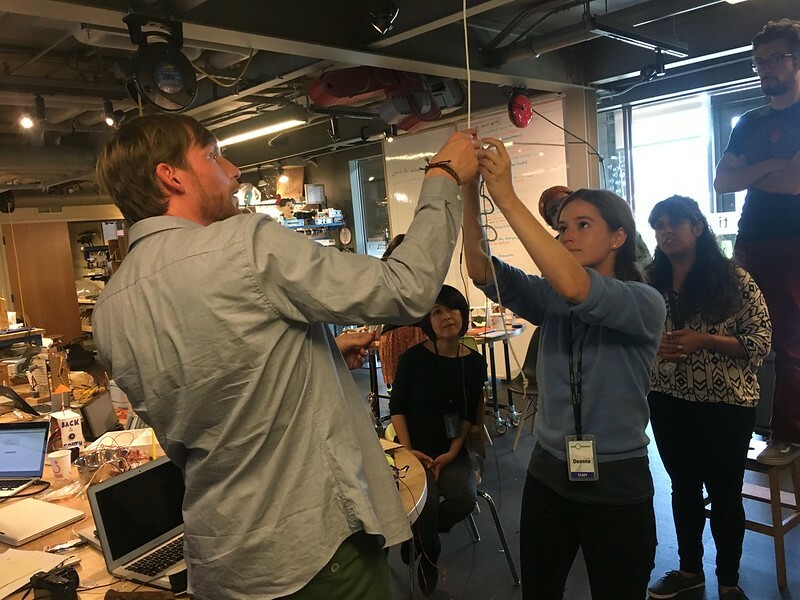 As another way of continuing the prototyping process with the tinkering explainers, we tried building together and solicited feedback about how it felt to be a learner testing out these two related activities. Throughout our prototyping process, we've been collaborated remotely with Amos from the LEGO Foundation to share ideas and prototypes over skype calls which often consist of us running back and forth arounf the workshop grabbing examples. One of our most recent ideas was trying to make LEGO mobiles by adding copper hooks to the material set.
. The idea of mobiles as another entry point to balance offers the opportunities for us to think about large scale kinetic instalations as well. Nicole experimented a bit with balancing a cast iron pan with a jumble of LEGO pieces as a demonstration of how to create equilibrium with something heavy and somthing light. 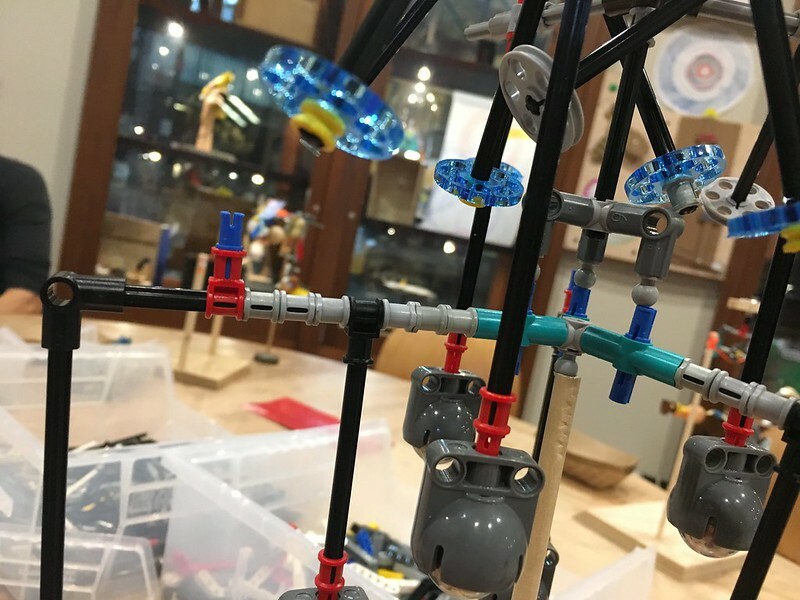 While we haven't tried out mobile making yet with visitors to the tinkering studio we are intrigued by the possibilties of adding another station to the mix to create a smorgasbord of #LEGOtinkering balance options in the workshop. For all three flavors of the LEGO balance we are still trying to come up with the a collection of starting points to encourage multiple pathways through the activity. 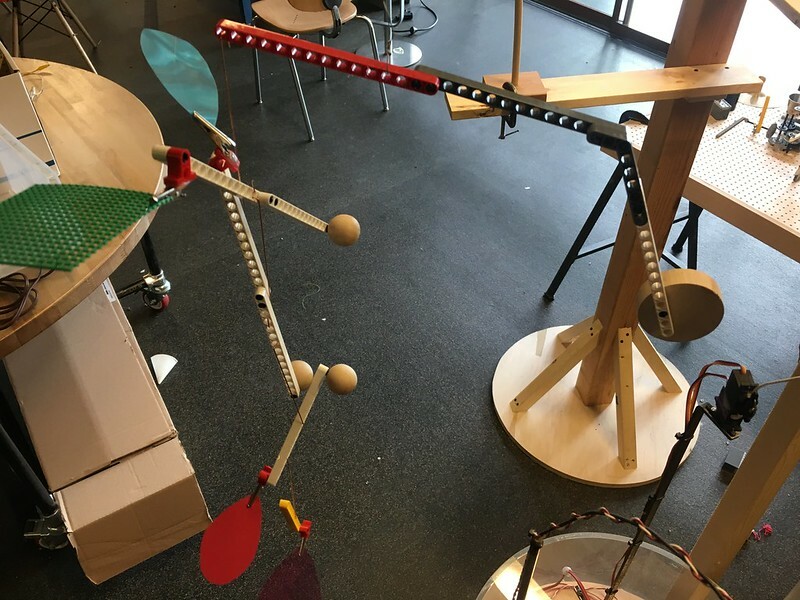 We have soem ideas, but are still hoping to refine these examples to also encourage participants to really experiment with the phenomenon of balance and make some unexpected creations. 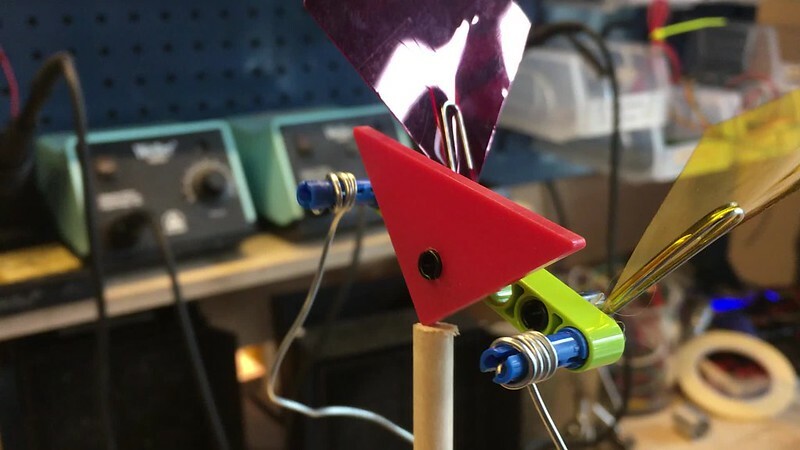 We'll continue to share our experiments here on the blog and eventually through another instructable highlighting how to build the various balance elements. 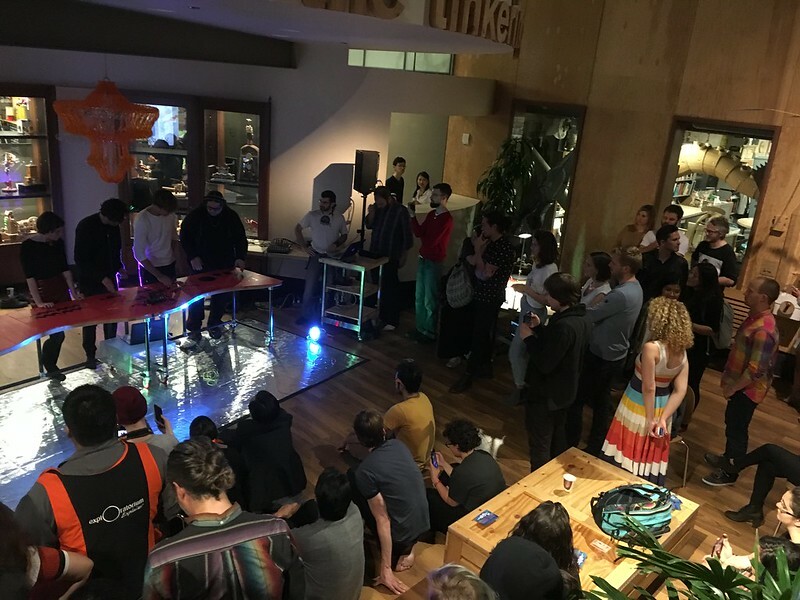 Last week we hosted Playtronica, an artist collective that bridges education, technology and play through interactive musical experiences. 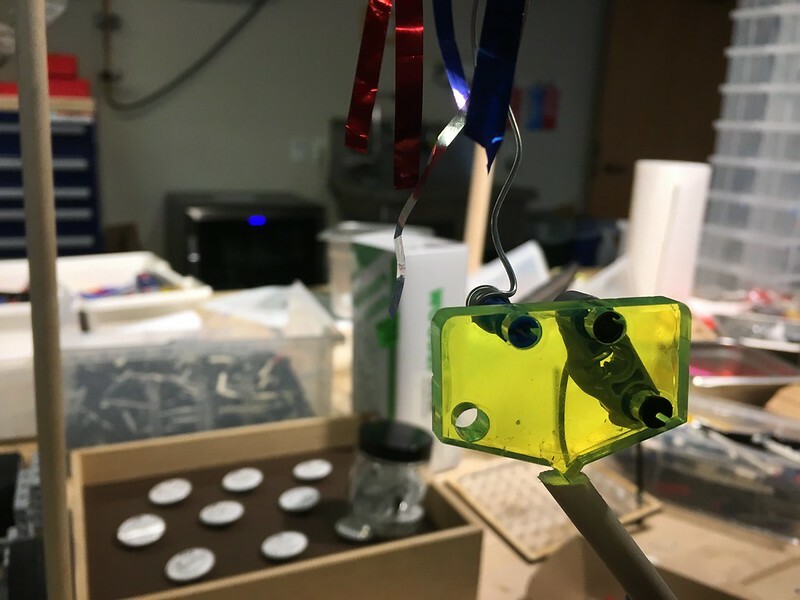 We were excited to explore their toolkit that allows for the creation of sensory interactions with objects and space through different materials and circuit boards. 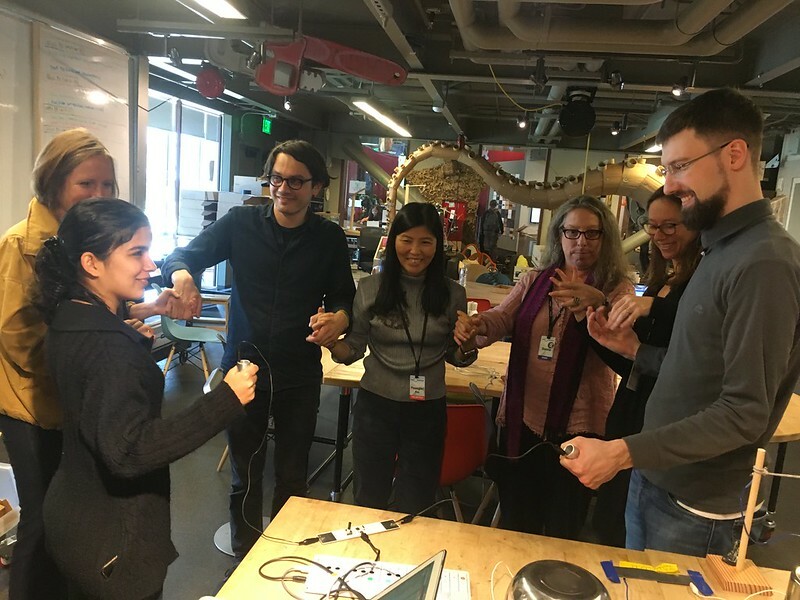 Playtronica collaborates with institutions, curators, educators and artists to create unexpected cultural experiences like a musical slack line or an intereactive playground of sonic vegtebles. It was a lot of fun to spend a few days together and get the chance to mess around with their tools and technologies and start to brainstorm how we can integrate sound and music with some of our new computational tinkering experiments They brought a collection of interesting components and custom boards to test out with our group. 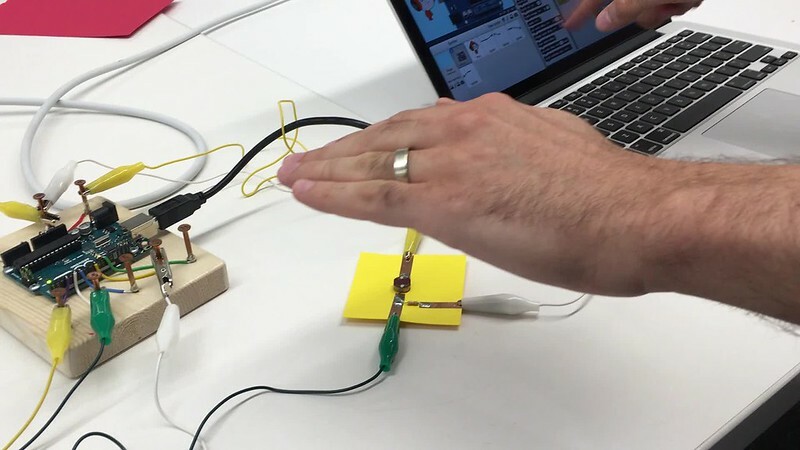 I thought it was interesting that they started out by using some preexisting boards like makey makey and the bare conductive touch board in their workshops and installations before developing their own products. 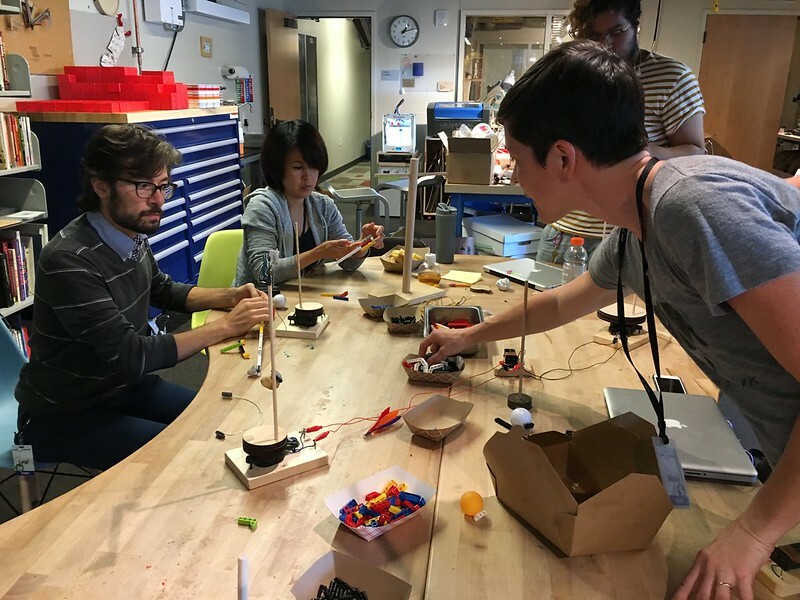 They started off the week by hosting a workshop with the extended tinkering studio team for a couple hours so we could learn about each other's work and try out some new things together. 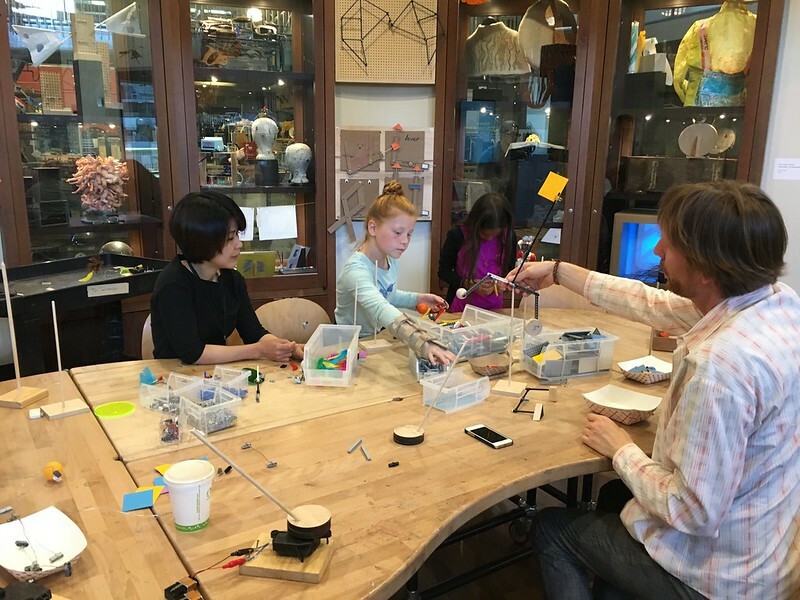 They were especially interested in combining activities and artifacts from existing tinkering studio activities with the sonic technologies. This was a great way to get started and helped us better understand their idea that 'things should sound'. One interesting thing that we worked on was hooking up conductive tape and fabric to LEGO sound machines setups to try and add some extra digital noises to the rhythm machines. I'd like to see how these technologies can be yet another way to integrate LEGO into a wider range of tinkering experiences. 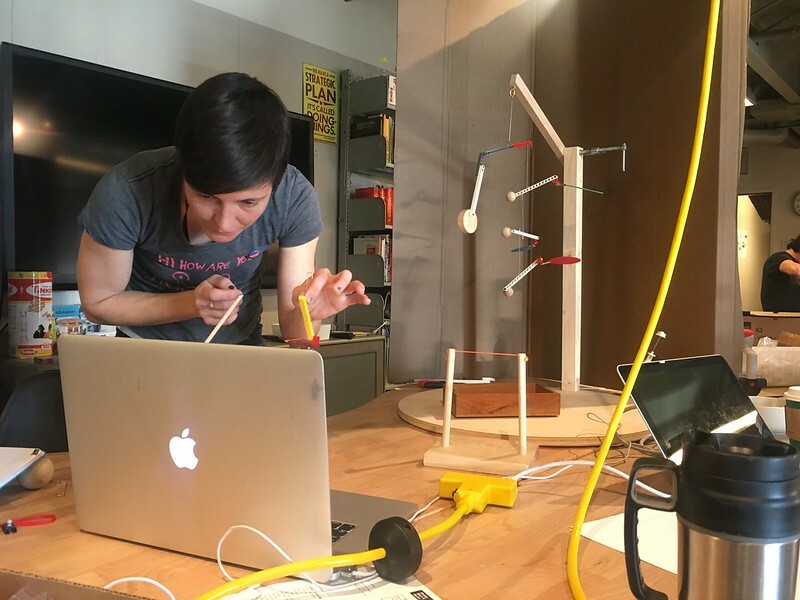 Deanna and Sebastian took the idea of the musical slackline and created a swinging pendulum with conductive fabric that changed sounds as the string stretched and loosened. If we had more time it would have been really fun to take some of these materials out on the floor of the museums to hear some of our exhibits in a new way. 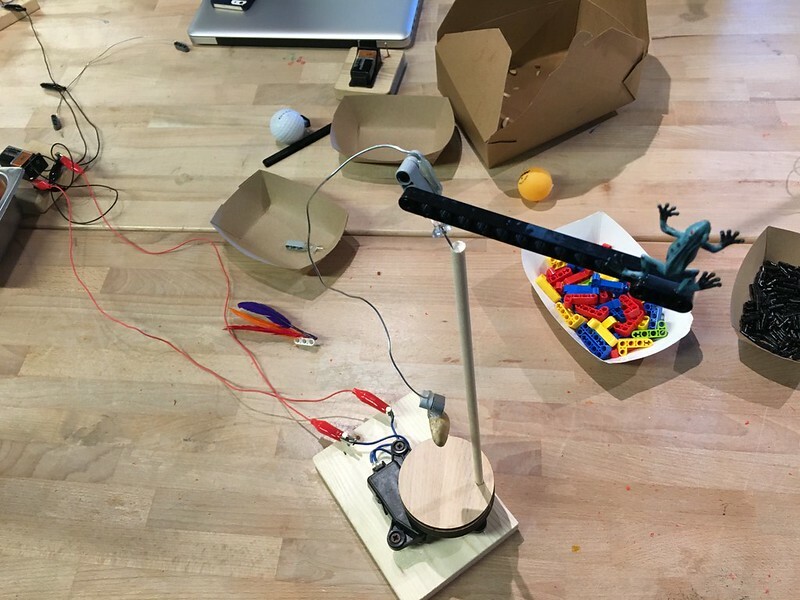 We also experimented with some of out LEGO tinkering balancing prototypes, specifically trying to make sounds through capacitance so that as the objects moved on the slow moving motor, they could interact without touching. It didn't quite work as planned but it was interesting to return to the problem of how to wire up something on a spinning motor. At the end of the two hour session, each group shared what they had been working on and what other things they would continue to think about. 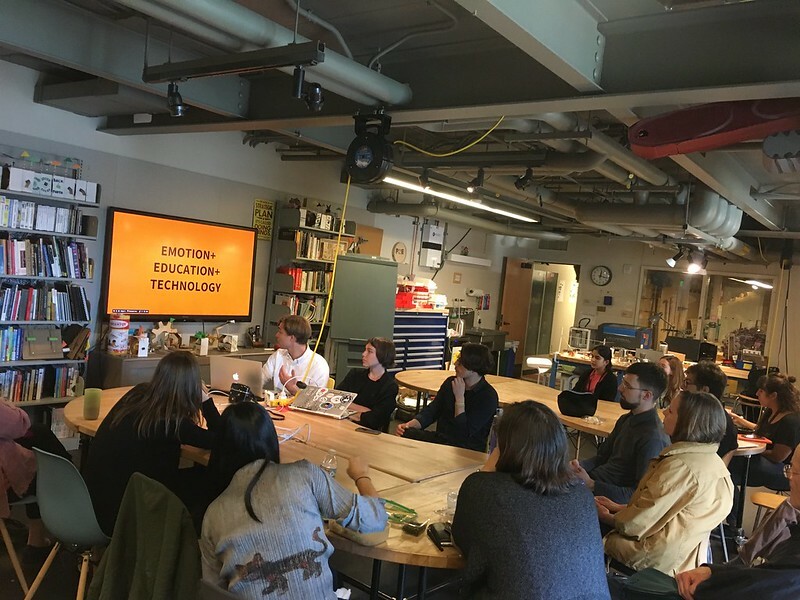 Later on in the week, Sasha and Andrei presented about their work in an informal brown bag in the learning studio for the rest of the museum staff. We got a cross-section of people from different departments interested in their ideas and projects. 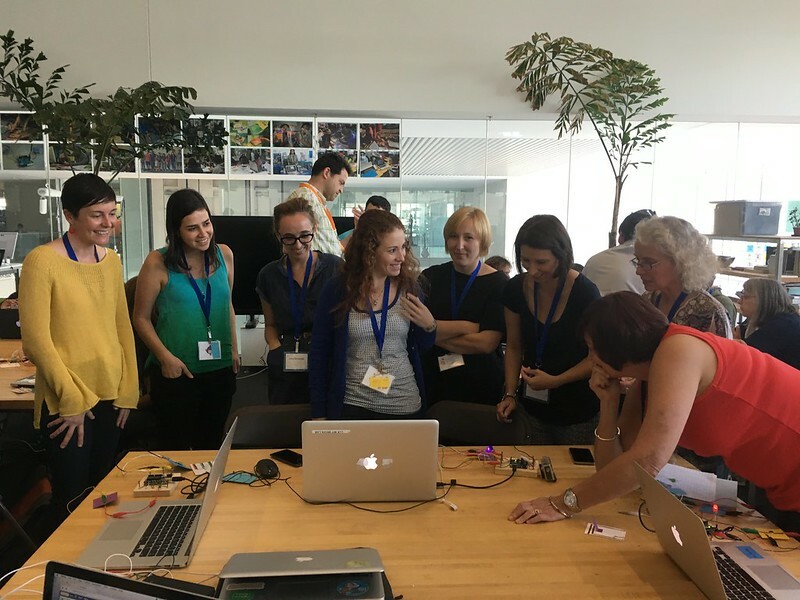 After the presentation, a group of us tried the 'touch me' circuit board, a version of the brains of our musical bench that makes set up and experimentation easy and allows for many people to play and experiment together. And we continued to explore their circuit boards with other materials and sensors that we've played with in the tinkering studio. Adding a light sensor to the musical 'touch me' circuit created a quick and playful impromptu installation. By Thursday, we started to prepare for a public event during the adult hours in the vein of our previous tinkering social club programs. 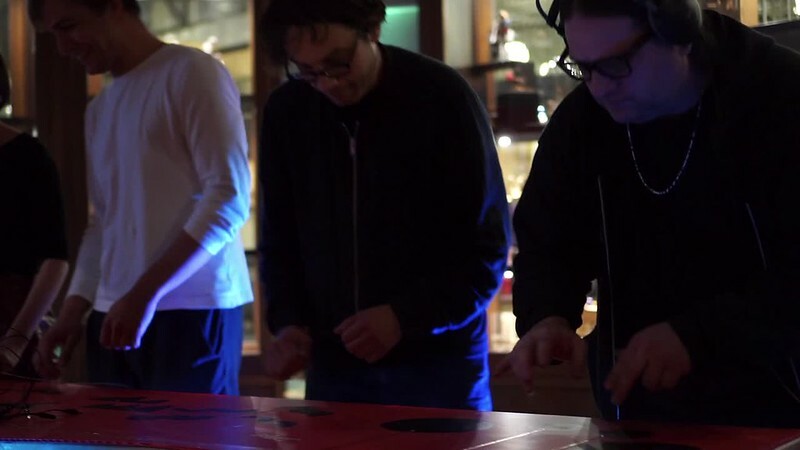 Our plan was to show a few small scale demos, host an interactive installation, and have Playtronica perform alongside a local electronic music group called LoveTech. There was lots to take care of and prepare before the event. 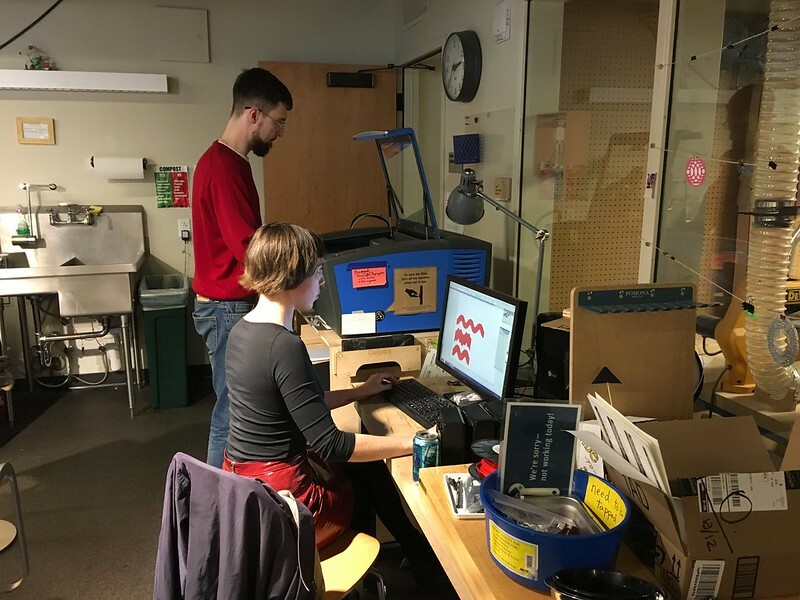 Sergey and Aglaya get started on the laser cutter to cut out stencils to use with conductive paint in the creation of an instrument for the performance. 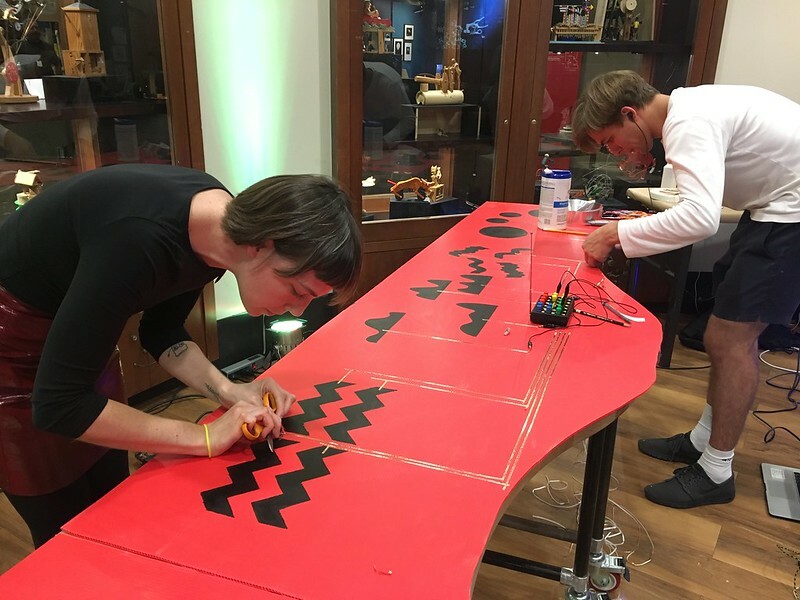 We found an awesome bright red sheet of packing material in the shop racks, we cut it to the size of two tables, and stenciled on the conductive paint designs in groups of four. By adding copper tape, we could connect the inputs to the playtronica box to assign each touch pad a unique sound. For the installation, a few project explainers helped us set up in the tinkering studio by taking three 4x8 sheets of cardboard and coating them with aluminium tape. Together this would be serve as the pad for our interactive installation. 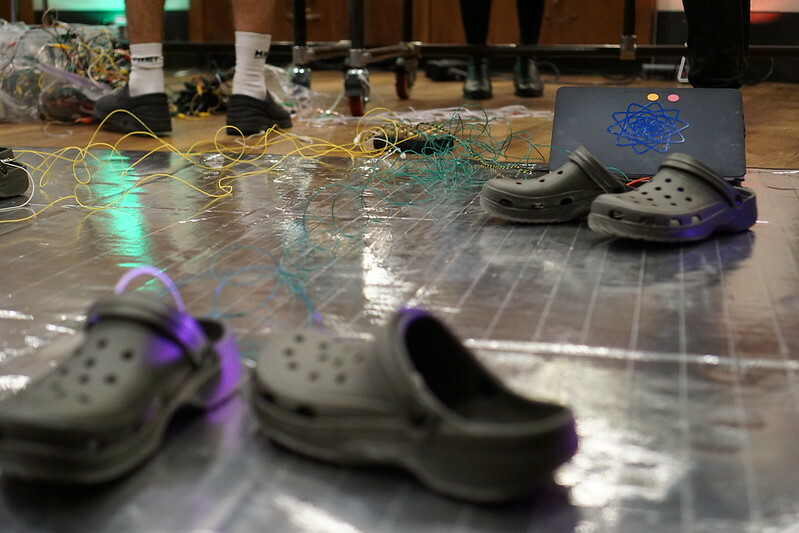 The idea was that the performers would wear fake rubber crocs from Daiso to be insulated from the floor that was connected to ground. Each of the performers had one of the other sides of the circuit attached to their wrists with a wire. Other people could take off their shoes, step of the floor and "play" the performers simply by touching their hands and completing the connection. 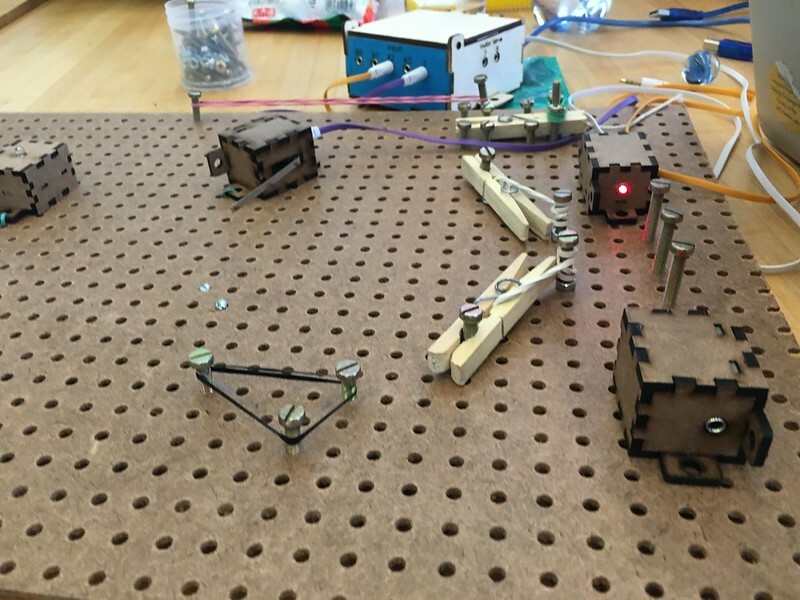 One of the small experiments on the table was a recreation of the light sensor circuit from earlier in the week with a hacked circuit board toy part controlling the rhythm of the music. Visitors had a lot of fun exploring these ideas when there wasn't a central activity going on in the space and they sparked a lot of questions and conversations. A couple of times over the course of the evening, we gathered volunteers to join in the interactive installation. 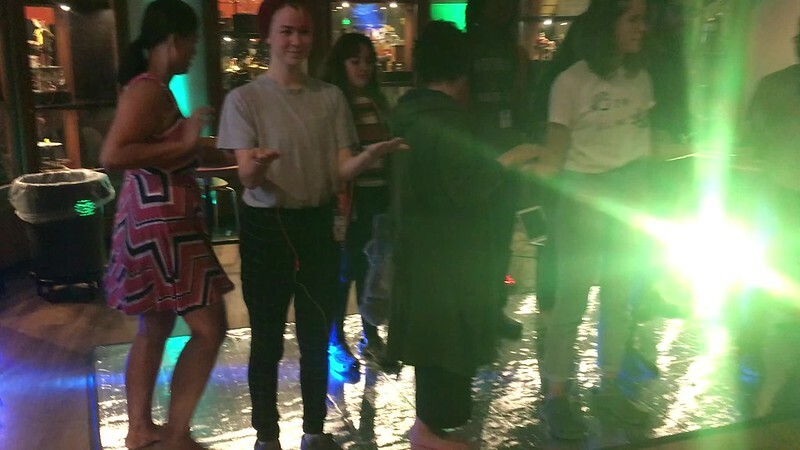 Lots of people enjoyed kicking off their shoes and making music with our group of performers (many explainers included) who tried to stand still and keep a straight face as participants moved around the metallic floor and touched their hands to make sounds. 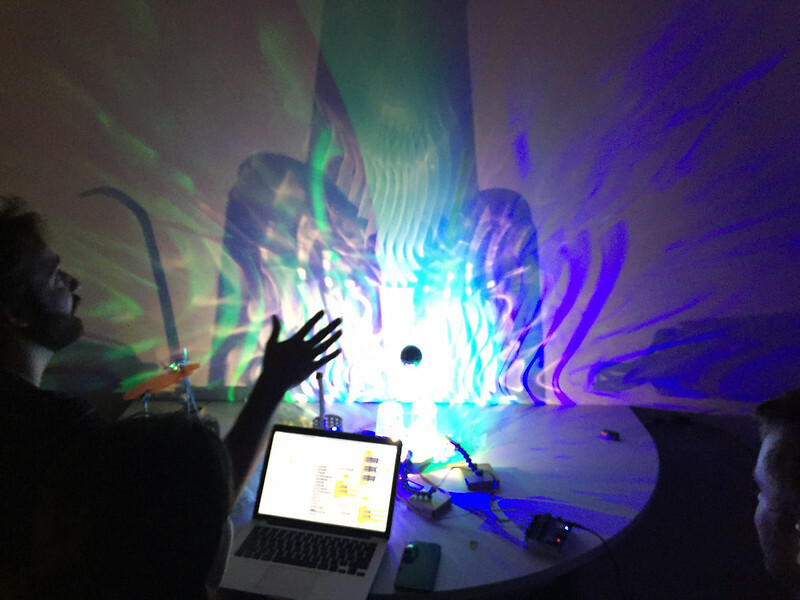 The principle is similar to some makey makey experiments that we've tried, but something about the good speakers, the darkened environment, and the large scale of the interaction added an extra playful and immersive dimension to the collaborative experience. Around eight o'clock we had our first performance from the Playtronica and Love Tech musicians. 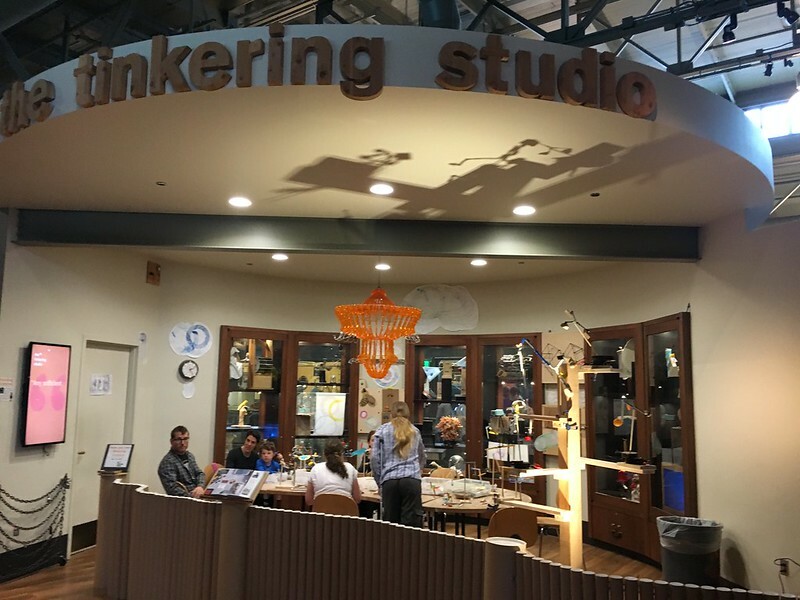 It was great to see the entire Tinkering Studio start fill up with excited people ready to listen, and get more and more crowded as curious visitors stopped by to hear what was going on in the space. I think the shape of the workshop worked well for the tiny concert and it was a nice culminating event for the residency to perform in this community setting. The group sounded great and again to me it emphasized the importance of demonstrating not only the low threshold digital sound experiments like a makey makey banana piano with computer speakers, but and the high ceiling possible with these materials when accomplished musicians create immersive soundscapes and play them on these large scale instruments. It was very inspiring for us to get the chance to work with the Playtronica team and I'm looking forward to more chances for future collaborations. 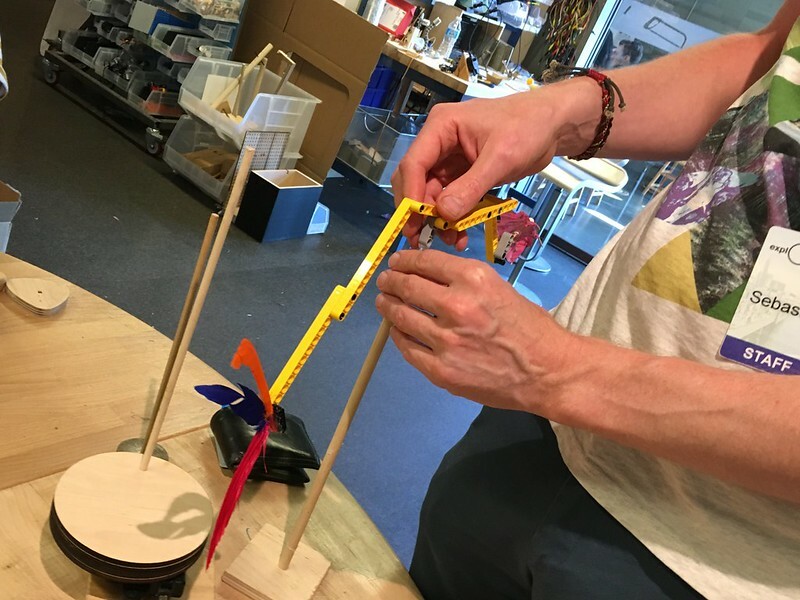 After spending a couple of months prototyping ideas LEGO art machines and sound makers, we've now started exploring balance as the next LEGO tinkering theme. 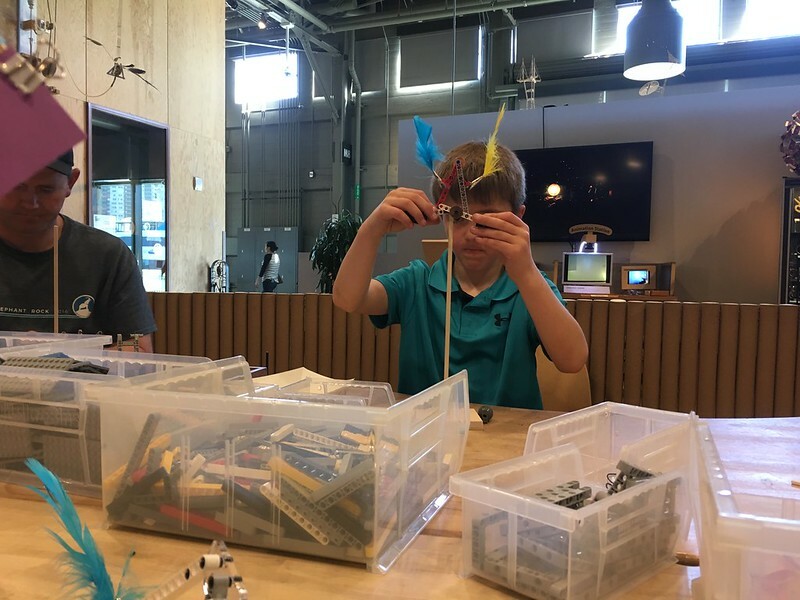 Amos from the LEGO foundation has spent some time working on an activity called 'sky parade' where participants build motorized gondola-like contraptions and we've seen Peter from the Science Museum of Minnesota testing out zip-line creations in his camps and classes. 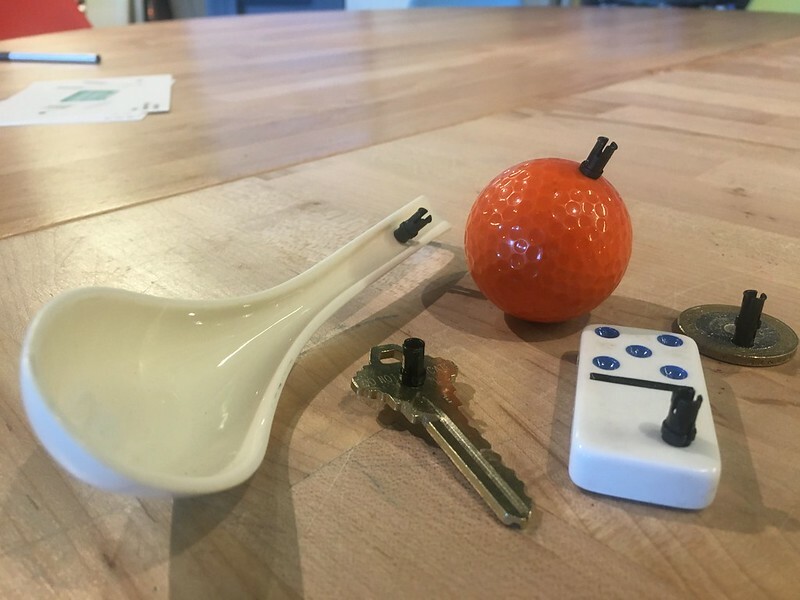 While we've been inspired by these ideas, we wanted to start out with simple non-motorized objects that balance on a single point. 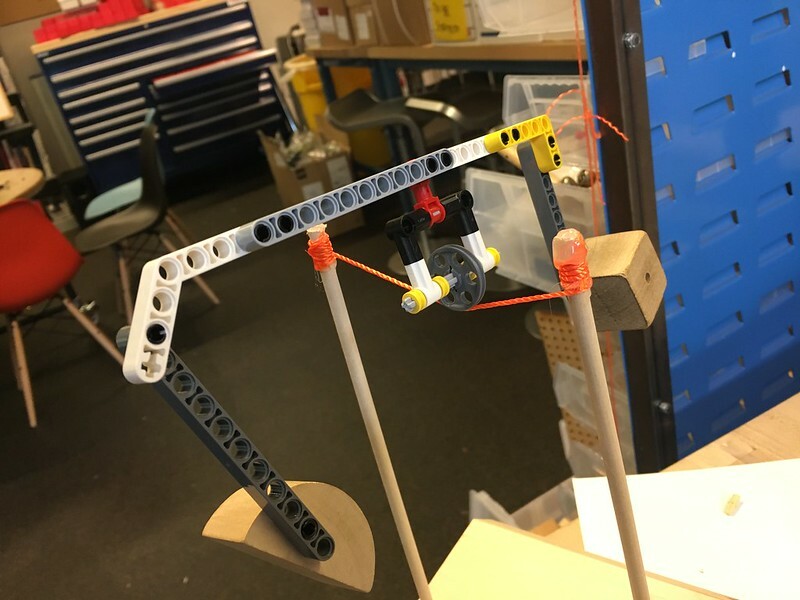 A few years ago we experimented with balancing objects as part of the Open MAKE: Toys event and at the subsequent Bay Area Maker Faire, and these initial ideas gave us a starting point for LEGO balance R&D. For our first testing session with just our team, I hot glued thumb-tacks to three hole technique beams for a balancing point and also used hot glue to attach objects of different weights to LEGO pieces much like the clothespin we used for the previous two activities. While this worked pretty well on the dowels, it made it painful to balance on our fingers which turns out to be a good way to feel to weight distribution. We also set up motors to give a sense of movement to the objects after they became stable on a point. The spinning platform allowed for a more suspenseful display and as we started testing, we also found that it would be better if the stick was diagonal so that the weight on the bottom could hang unimpeded. We noticed that slight differences in the creations really affected the balance. Meg developed a new piece that allowed her to slide an axle back and forth to create more minute adjustments then the technic hole pins allow. 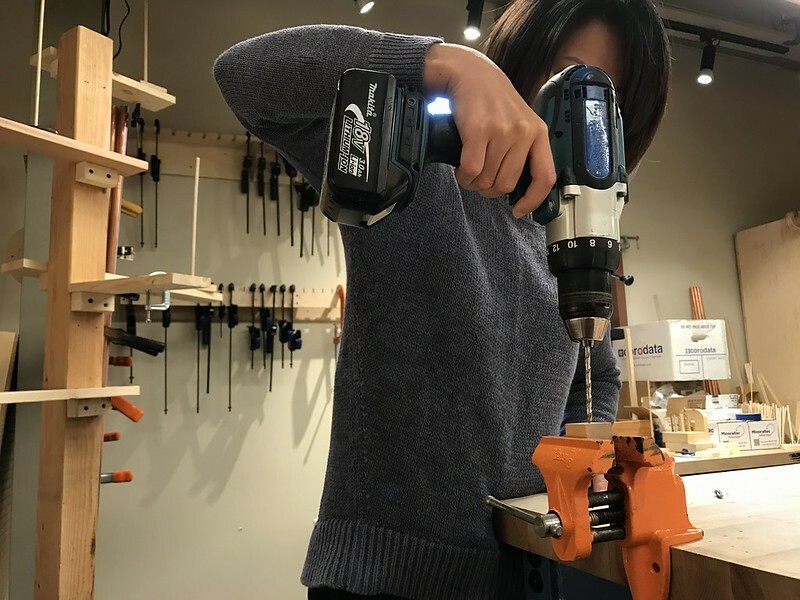 And although we started with gluing everyday objects to technic beams, Nicole devised a more elegant solution of just drilling a hole the same size as the technic pin in various objects. This allowed us to connect lots of different materials to the LEGO set in multiple orientations. This technique also allowed us to think about other types of starting points for the balancing objects that would be a little easier to work with like this acrylic triangle. We also experimented with lasercut pieces that could both have a single point to balance on while also having attachment points for different types of LEGO pieces to come off at more helpful angles. 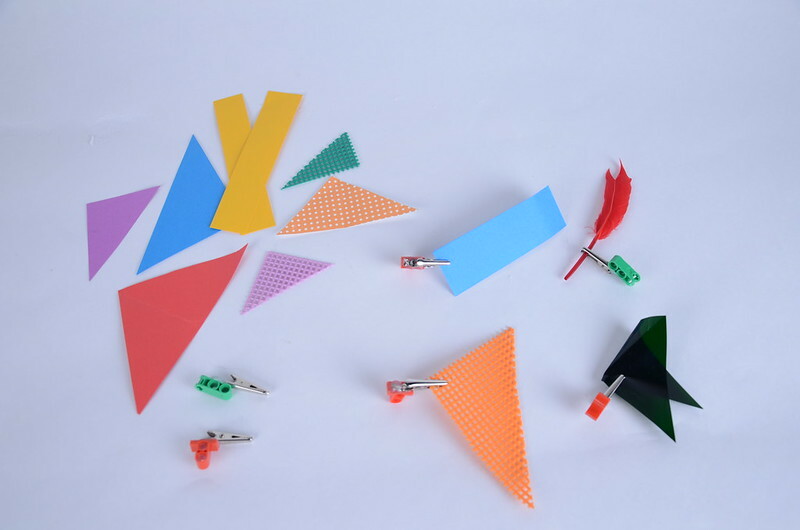 We also hoped that by gluing alligator clip heads to a type of technic beam, we could more easily attach light objects like paper, colored plastic, and paper to the balancing sculptures. One thing that's interesting to experiment with for the balancing sculptures is to arrange both very heavy and very light objects in ways that produce unexpected equilibrium. 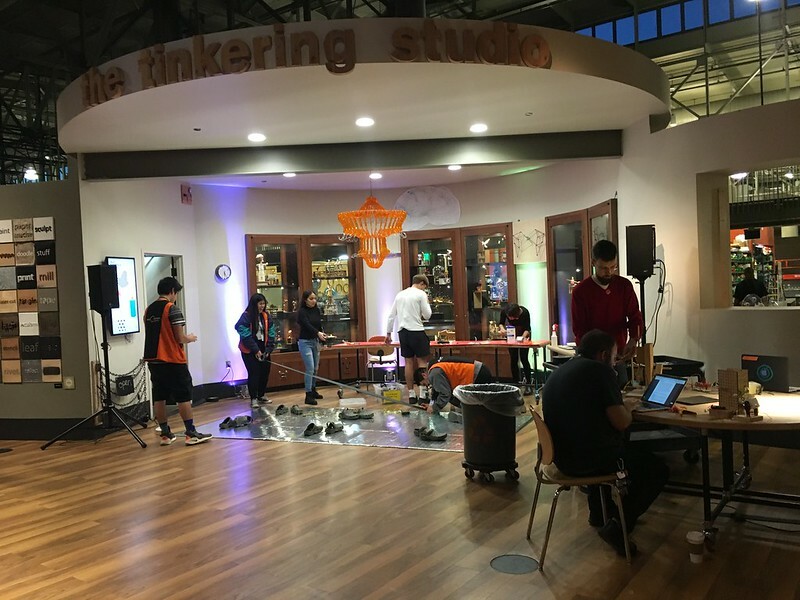 A few days later, we took an initial set of materials on the floor to start testing out the activity with visitors to the Tinkering Studio. As usual, giving participants the chance to try out these half-baked ideas allows us to learn quite a lot about the possibilities for the exploration. As we built examples and saw what visitors tended to begin with, we moved a bit away from the custom starting points and tried to come up with various 'base models' using only LEGO pieces. Some of the triangle shaped pieces gave us the chance to experiment with different possible ways to arrange the weight on the below the sculpture. Storytelling seems to be an important part of the activity and we saw balancing characters from chickens to spaceships. We think it could be fun to push on the narrative element to give people the chance to really personalize their creations. However, abstract shapes and colors also seemed to be a compelling direction and we were excited to see how this different frame could get us to think about the LEGO pieces in a new light. We'll continue to explore these ideas in our workshop and with visitors to the museum. We're looking forward to sharing the results of the R&D and getting to see what others try around this topic! 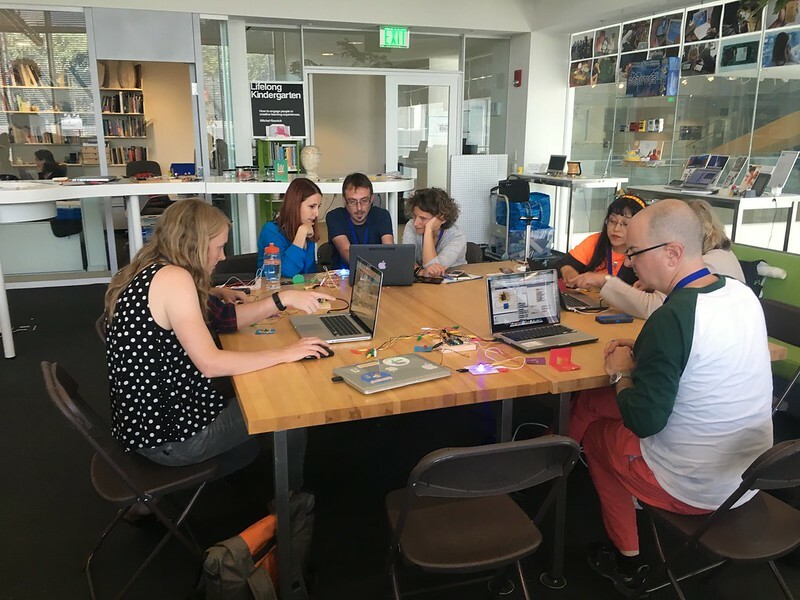 Earlier this month, Nicole and I traveled to the MIT Media Lab for the 2016 Scratch conference. At the event, we led a workshop on scratchpaper and shared some of our recent experiments around computational tinkering. 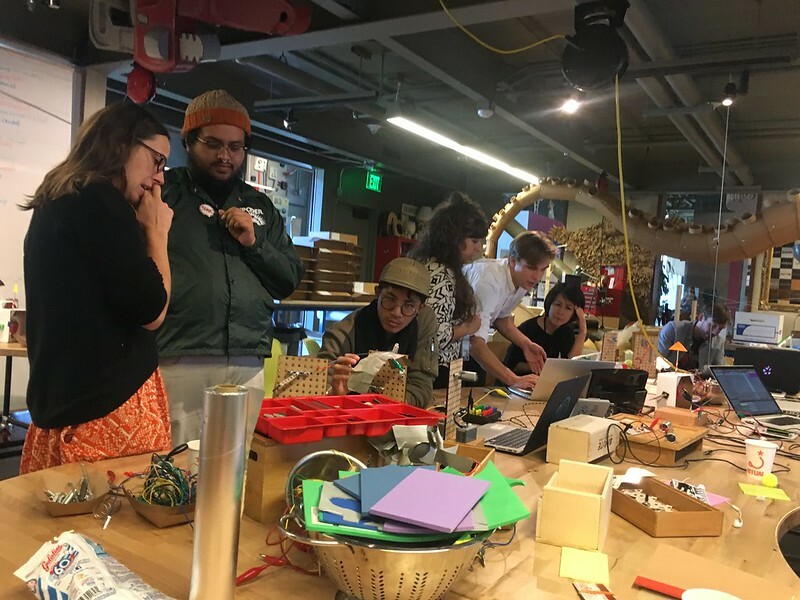 After the conference we stuck around the lab for a couple days to share ideas with members of the Lifelong Kindergarten (LLK) group, continue to work through prototypes, and plan next steps around tinkering in the digital world. 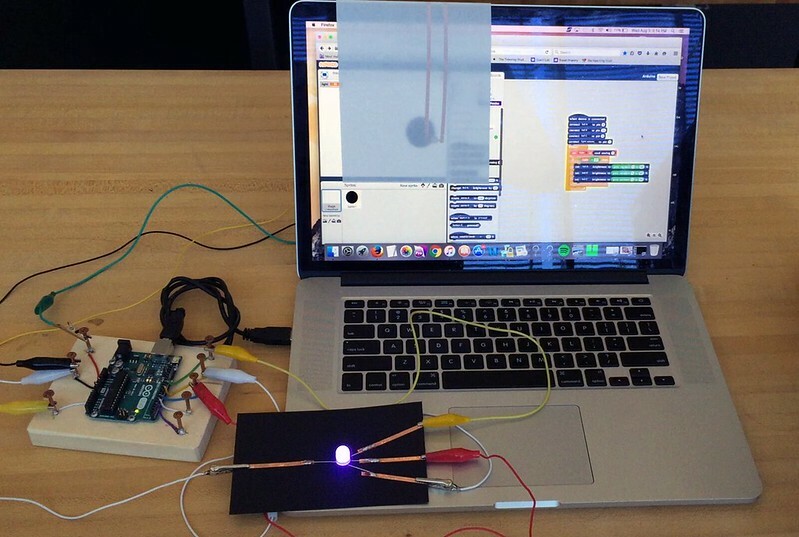 We're interested in the possibilities of developing a programmable light play activity. 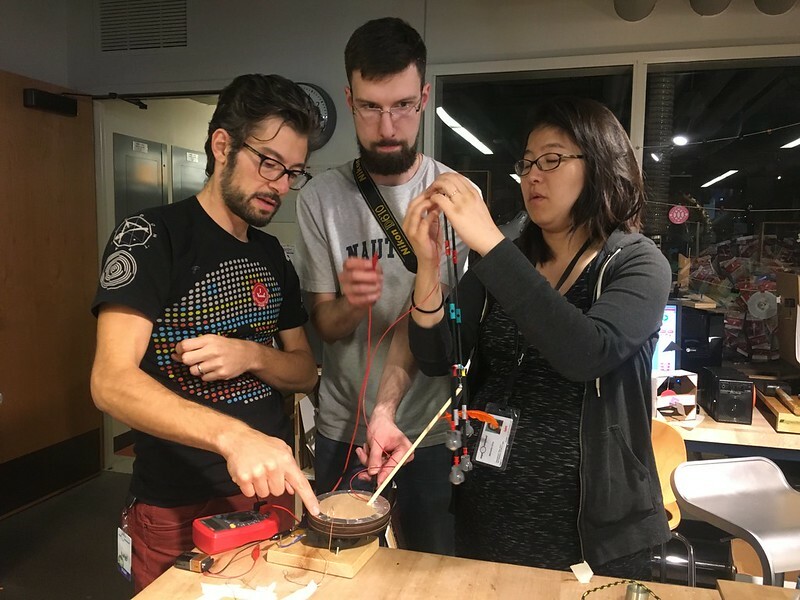 Earlier in the year, some of the LLK team visited us at the Exploratorium to share initial prototypes for rainbow colored lights, adjustable motors and a special version of scratchx that can control the components. 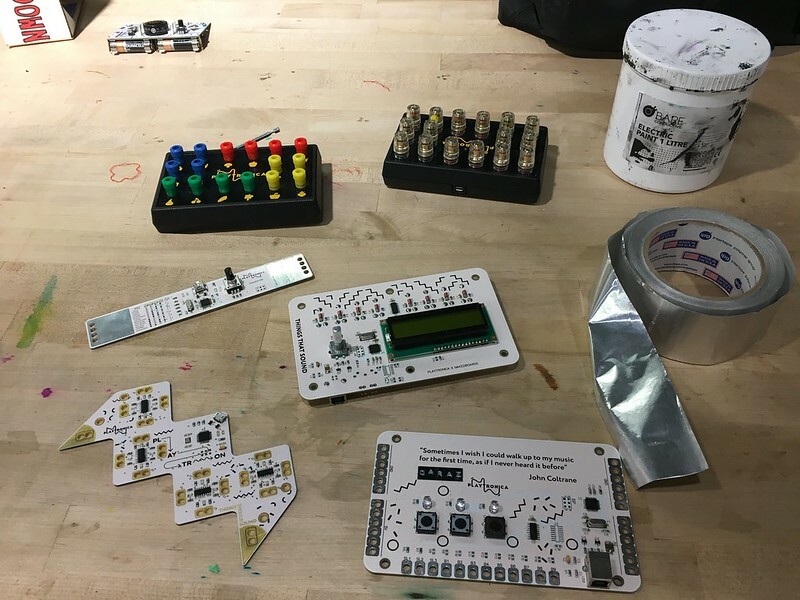 The group at MIT has continued to test out versions of the hardware and now we are ready to start experimenting with the parts and thinking about the experience. 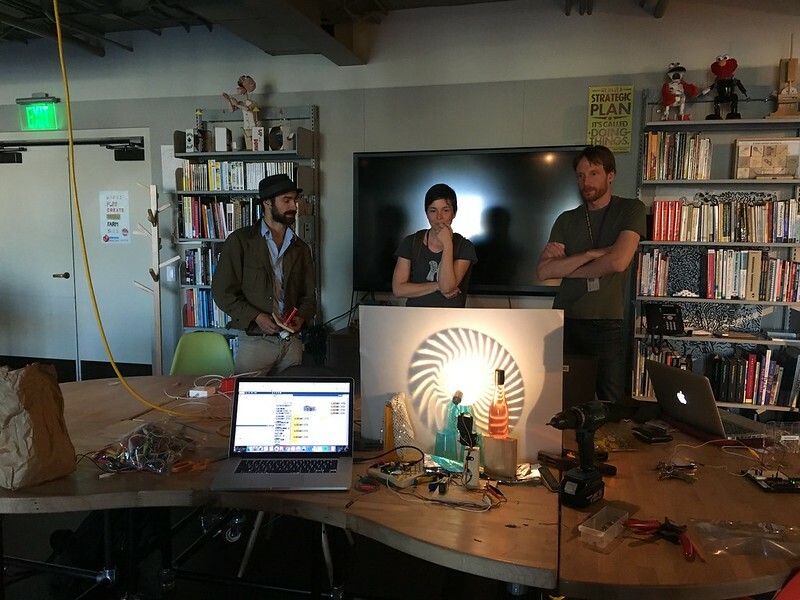 We ran an impromptu workshop with a few members of the Scratch team to share initial ideas around lightplay. One thing that we noticed was that it felt nice to use the big white walls for the programmable displays instead of containing the light and shadow elements inside small boxes. As we continue to think about combining the physical and digital, it will be important to pay attention to the scale of each aspect. The next day we continued our explorations by trying out scratchpaper one more time with the scratch team. With this group, the wide walls of the activity shone through. Since this group had more scratch experience, they created some really complex projects like a reaction time game, a fortune telling machines, and a skydiving simulator. One project that I thought was really interesting had a blue monster both in the real world, with the little vibrating pager motor paper, as well as animated on the screen. 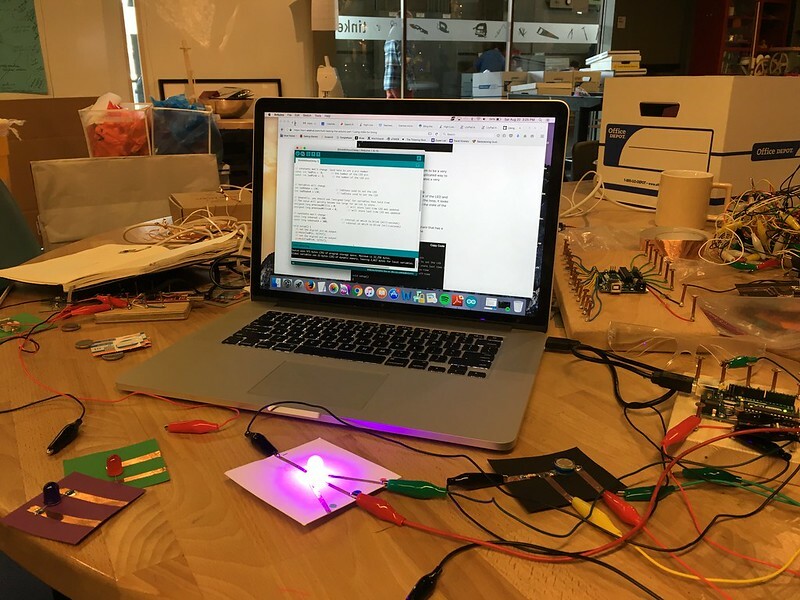 It felt really natural for participants to switch between both modes, but we wished that the grey arduino blocks on the scratchx screen could feel as friendly and playful as the colorful paper circuit examples. 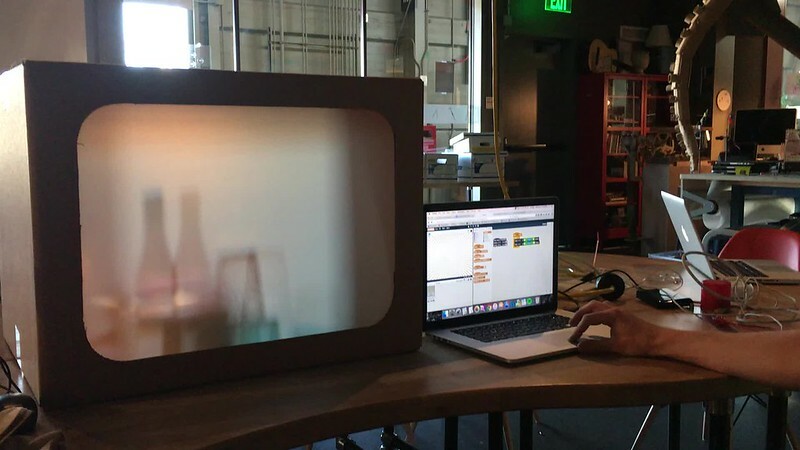 Eric Rosenbaum joined us and combined the scratch arduino extension with another experimental version that he's been working on the adds a synthesizer to the sound library. 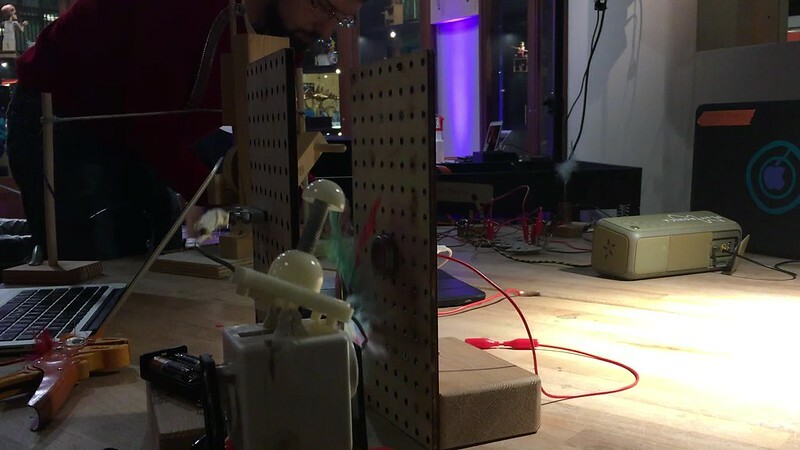 He combined the specialized sounds with a light sensor to created a space-age theremin-like instrument with a really cool effect. It would be fun to think more about adding sound and music to the mix of examples and starting points with this activity. 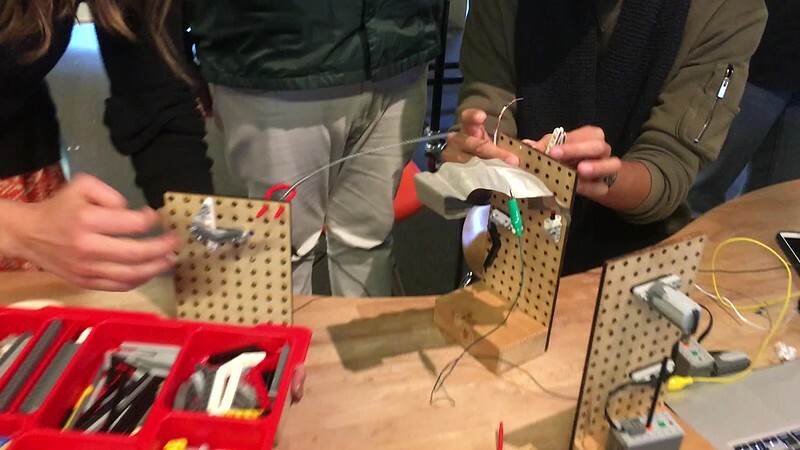 Cassia, a educator from Sao Paulo who has been spending the summer in residency with the lab, also shared some of her recent experiments with using a different type of arduino connection to make pinball machines in her after-school program. 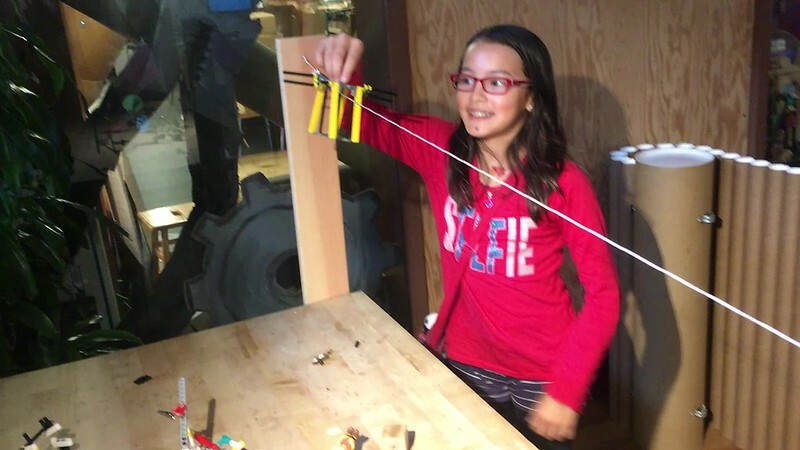 Her team's work to lower the threshold for programming physical elements has inspired us for a long time and we are looking forward to exploring adding scratch elements to homemade pinball machines, maybe in one of the tinkering after-school programs. 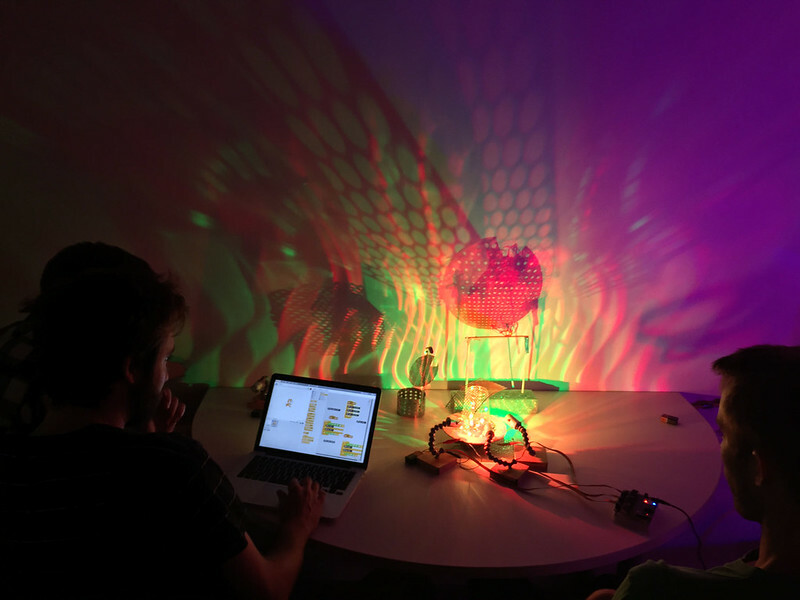 Our experiments have continued back at home with both light play and scratchpaper and we started involving more members of the team to help prototype new ideas. Since light play will be the first in depth computational tinkering exploration, we started by setting up a screen in the LS and gathering some familar elements. I was inspired by Mitchel's keynote at the Scratch conference where, in a tribute to the ideas of Seymour Papert, he explained the importance of learners embodying the programmed element, from the turtle to the sprite. This idea got me thinking about servo motors and the control that they offer to the light play system. I re-purposed the inner workings of Nicole's Scratch xylophone from East Bay Maker Faire to make a little programmable "light turtle" that could be controlled through scratchx. We were able to write a quick program for the light to follow the movement of the mouse or a sprite on the stage. While I'm not sure how easy it is to get started programming servo motors, I liked how the light turtle instantly had a poersonality depending on the movements. It's a little bit of a side track to the programmable rainbow lights and motors, but I think we could be thinking of multiple entry points to the activity. 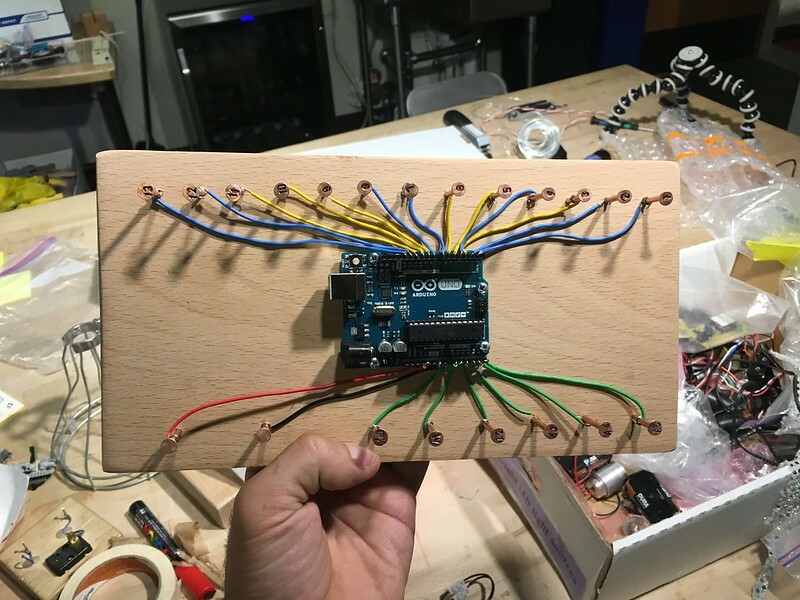 Getting back to the world of scratchpaper, I built a wooden arduino mega board with copper nail connections for all of the digital and analog pins. This massive circuit board isn't the right scale for beginners but I thought it might come in handy as we continue prototyping more complex scratchpaper ideas. And finallly, last weekend, Jie Qi, an artist from MIT who got us started thinking about paper circuits many years ago, stopped by our workshops to share some of her latest experiments with me and Sebastian. She is working on a really cool circuit board that can connect to a paper circuit with a binder clip and can be programmed using a cellphone. We'll be really excited to test out these ideas when we can get our hands on a more finished version. 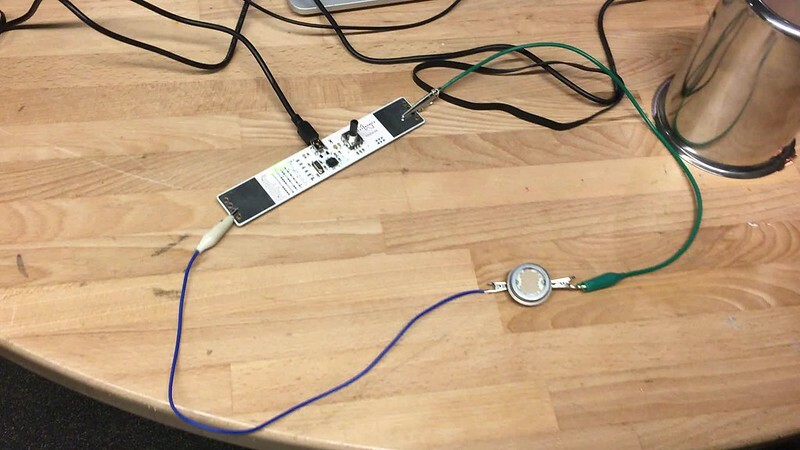 Jie also helped me go a bit further in my experiments with attiny and arduino programming. One big shift from Scratch to the arduino IDE is that creating parallel programs can be a challenge. We used the timer function to create different patterns and trying to use the sensors from scratchpaper to make some simple projects. 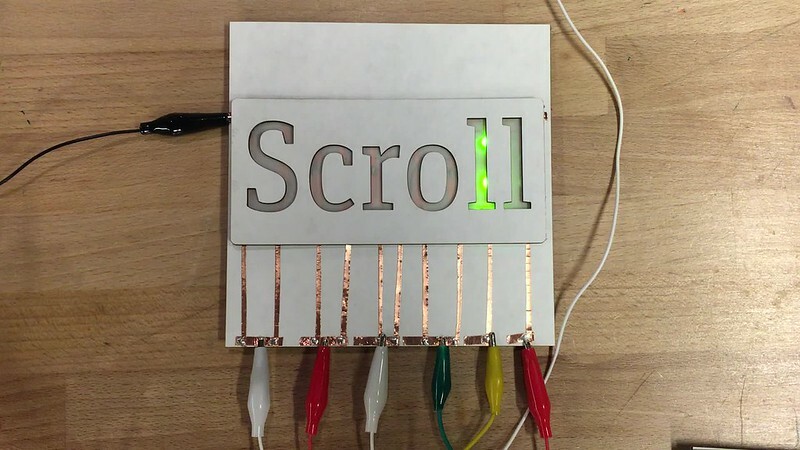 I like how the pysical elements of scratchpaper can be a stepping stone to programming arduinos or attinys, but we'll need to do more experimentation to scaffold the experience. Jie inspired me to get going on another project we've been talking about for a while, a computational version of Nicole's tinkering verbs tile wall. I'm excited about creating something in the workshop space to give people the sense of possibilities from programming. 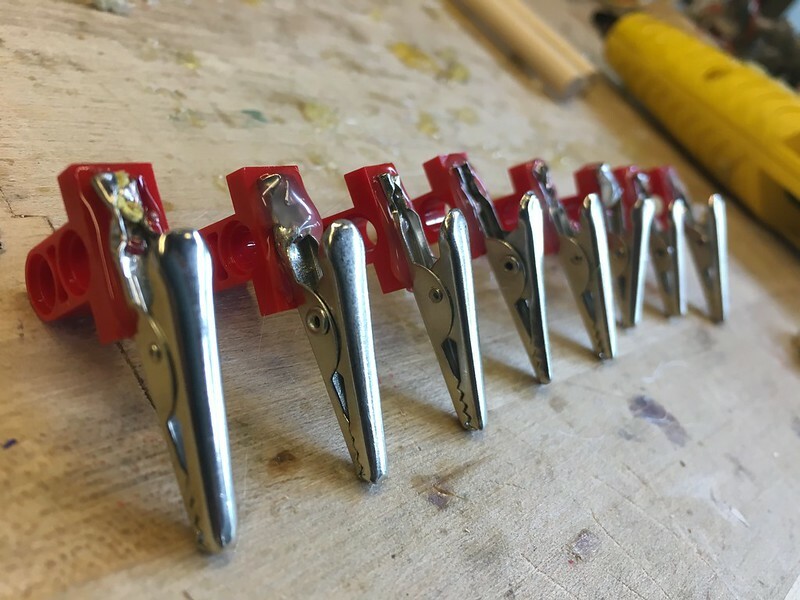 Sebastian suggested a different way of constructing the prototype so that the the process and materials that go into building it can be made visible through exposed alligator clips and copper tape. 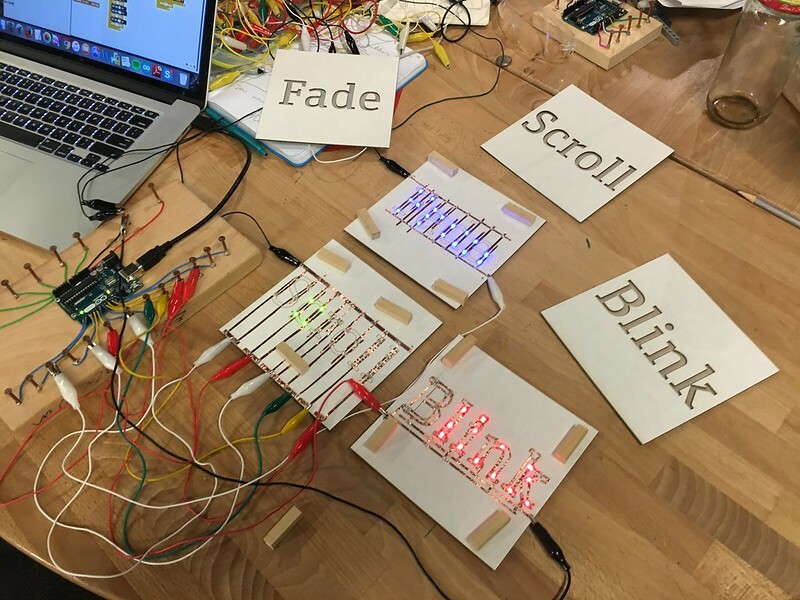 So far I only have made tile with verbs related to LEDs but some other programming suggestions by the tinkering twitterati include spin, shake, invert (servos) listen, see, press (sensors) and more general things like loop, repeat, wait, random, and reset! We're excited to continue experiments with tinkering with programming and ways to combine physical and digital world. We'll keep sharing our ideas and prototypes as we experiment ourselves with these topics. 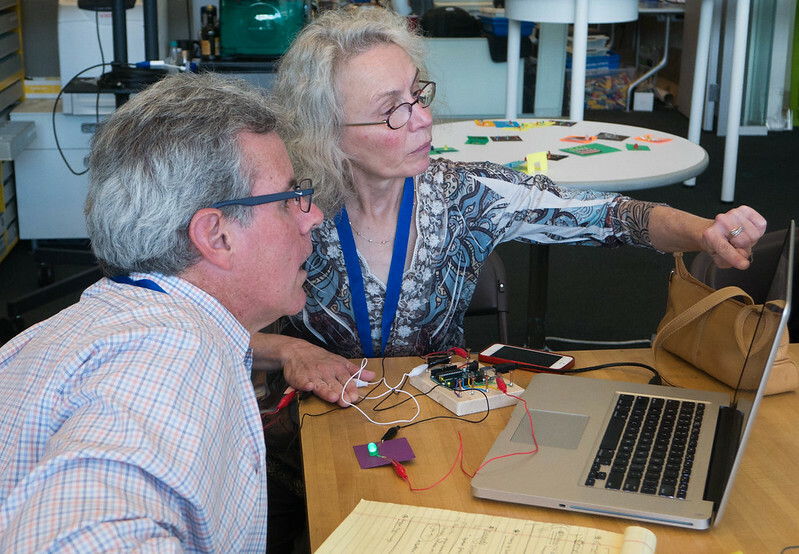 Last week, Nicole and I traveled to MIT for the biannual scratch conference and spent a few extra days sharing ideas and prototyping with our friends at the Lifelong Kindergarten group at the Media Lab. During the conference we ran a scratchpaper workshop, highlighting a new idea we've been developing to help learners get started with scratchx by programming paper circuit cards. The workshop took place in the LLK room at the Media Lab, an inspiring place where we felt right at home. 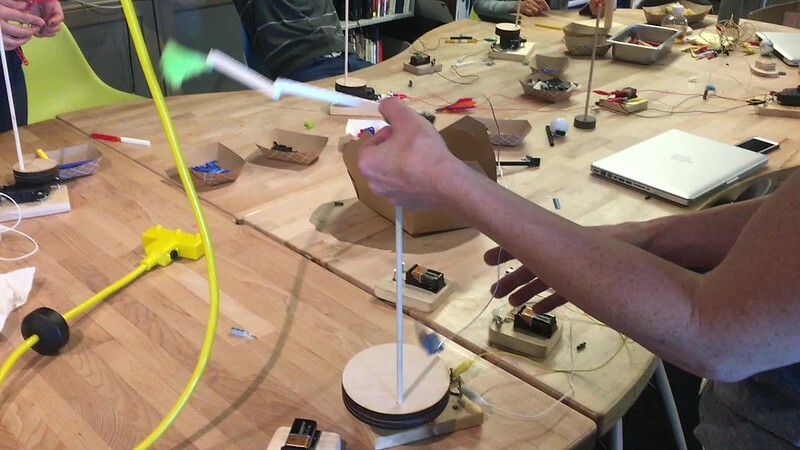 The twenty-four participants worked in pairs to explore the lights, switches, sensors, and vibrating motor monsters. We were a little nervous since this type of workshop required people using their own computers, downloading the right software and getting the example sketches transferred. Things went pretty smoothly, but as we move more into explorations of computational tinkering, these workshop logistics give us something to think about. Near the entrance of the room we created a 'corner of curiousity' to show off some possible extensions to the activity. 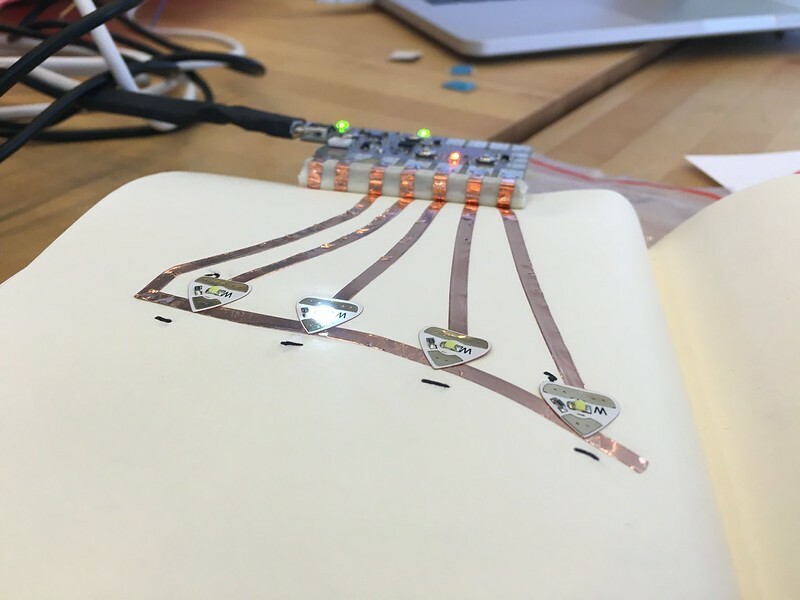 We included examples of paper circuits that use the attiny chip, some more artistic paper circuit examples and nicole's analog copper crown that uses light sensors and RGB LEDs in an interesting physical arrangement. 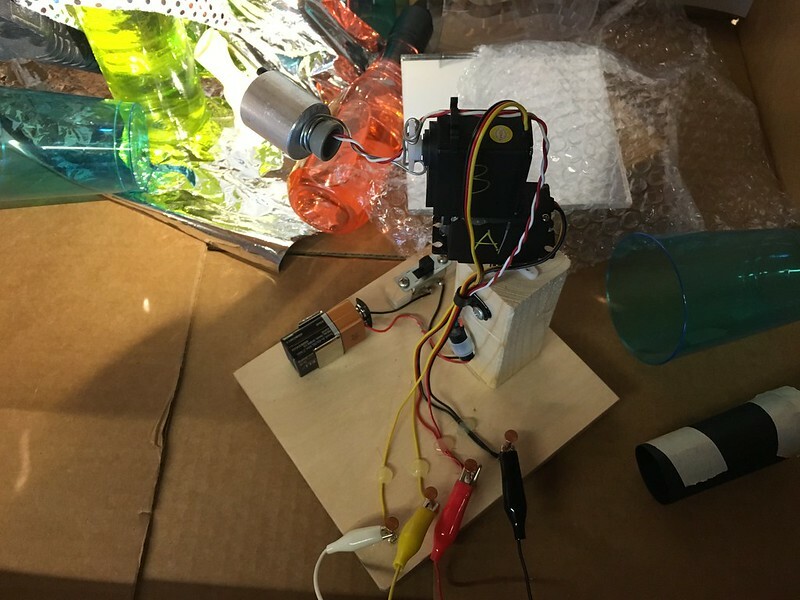 Nicole also made an example modeled after the work of Tinkering Studio AIR Shih Chieh Huang that incorporated the scratch stage into the project. As the black circle moved on the screen the RGB light changed color. 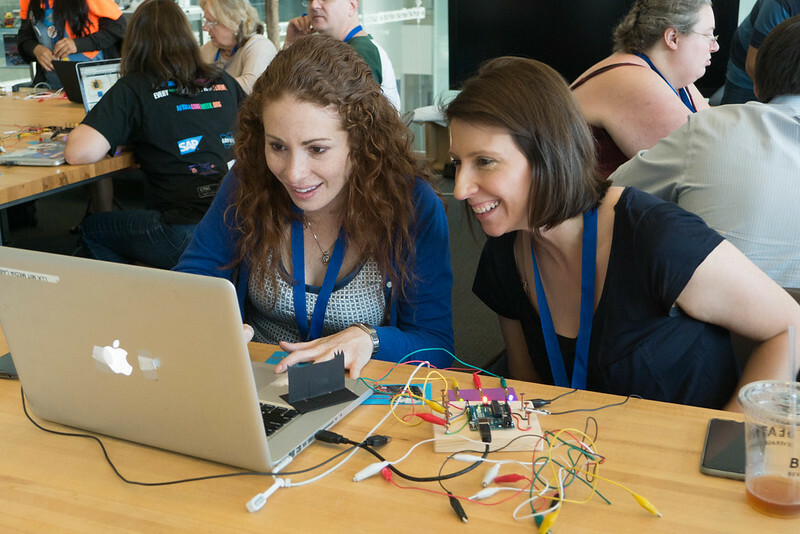 Although most of the participants had used scratch before, it was a first chance for many to explore the arduino extension on scratchx. We felt it was important to start with just a single light and a example sketch showing how to hook things up before moving to more complicated projects. 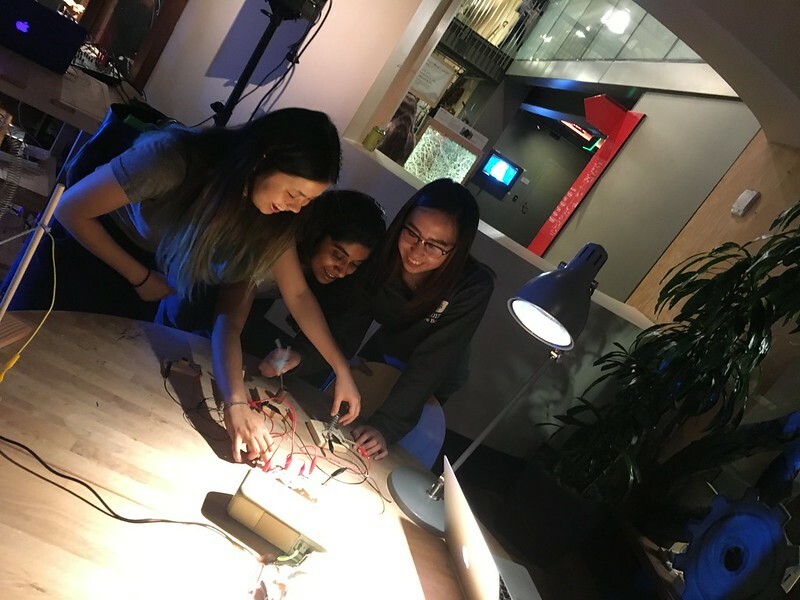 We wanted to support a collaborative and playful attitude for the activity since we were experimenting technical and possibly intimidating parts like sensors, resistors, and circuit baords. We felt that the social scaffolding of people working together and the mix of familiar and unfamiliar materials went a long way towards helping us create an inviting environment. Scratchpaper Frog Crossing from The Tinkering Studio on Vimeo. Participants made all types of projects using the physical objects, showing off the wide walls of the activity. 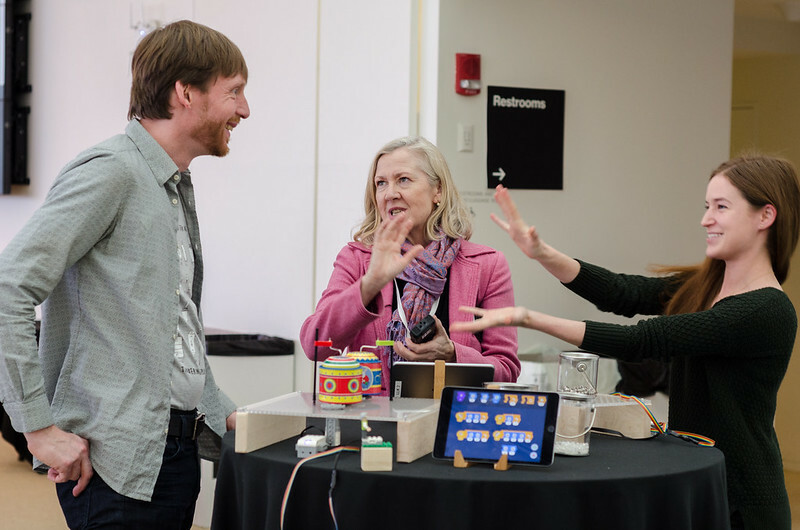 Some of the groups incorporated music, others turned into simple games, and some participants spent the time investigating all of the different components. One interesting project was a "street crossing frog" that moved when the light turned green and yellow but stopped when the light turned red. We spent about forty-five minutes exploring the scratchpaper construction kit, shared our projects and then reflected on the aspects of facilitation, materials, and environment that supported the playful and collaborative approach to learning. It was great to try this fairly new activity with a thoughtful and fun group of collaborators and we got a lot of ideas about how to keep developing the workshop. As well, we're looking forward to see how other educators remix the idea and make it work for their own setting. The entire conference was really inspiring as well. 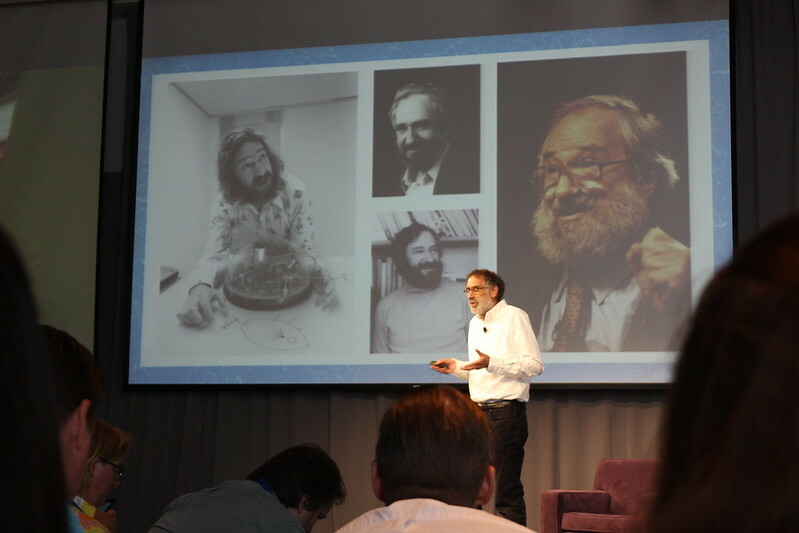 It started off with Mitchel Resnick, the leader of the LLK group, giving a emotional tribute to his friend and mentor Seymour Papert, who developed the idea of constructionism and whose teachings and writings greatly influenced the tinkering/making movement. I would recommend watching Mitchel's summary of Papert's ideas as well as the other thought-provoking keynotes that were thankfully recorded and posted on the Scratch conference website. During the three days of the conference, Nicole and I participated in workshops, roamed the poster sessions and listened to panel discussions. Some of the things that we're excited to try and learn more about include using the new microworlds feature of scratch to create more manageable starting points, the next iteration of beetleblocks, experimenting with WeDo to create playful motions and mechanisms, and using turtle stitch to export scratch designs to an embroiderly machines. 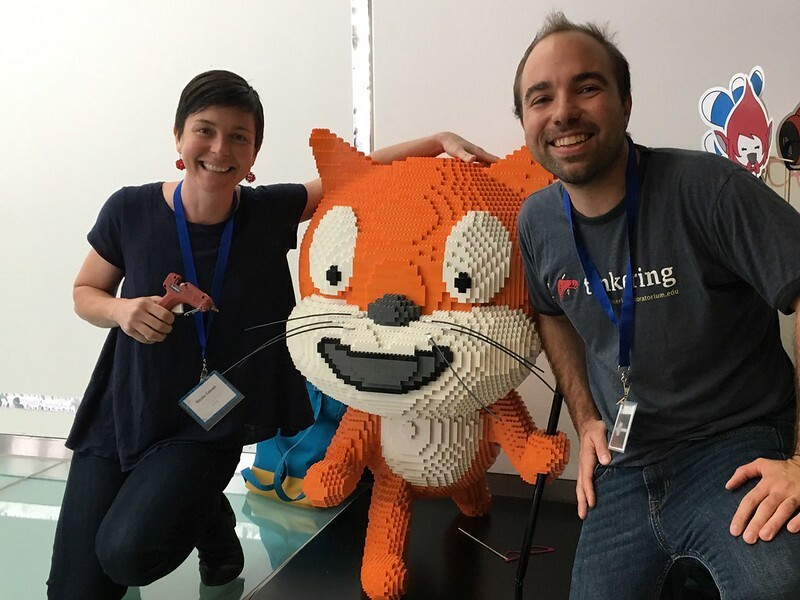 And we even had time to take a tinkering t-shirt challenge photo with the famous LEGO scratch cat! 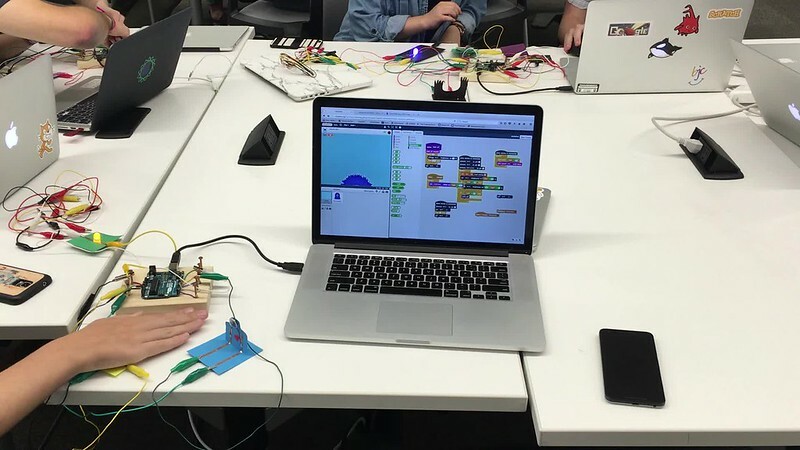 We'll continue to share our thoughts and experiments around scratchpaper as well as these other expressions of computational tinkering using scratch. People often ask how we design new activities. It's often tough to give a straightforward answer, because for us the development process takes place on a long time scale, involves iterating on prototypes and revisiting old ideas. We collaborate with outside artists and get inspiration from unusual materials. 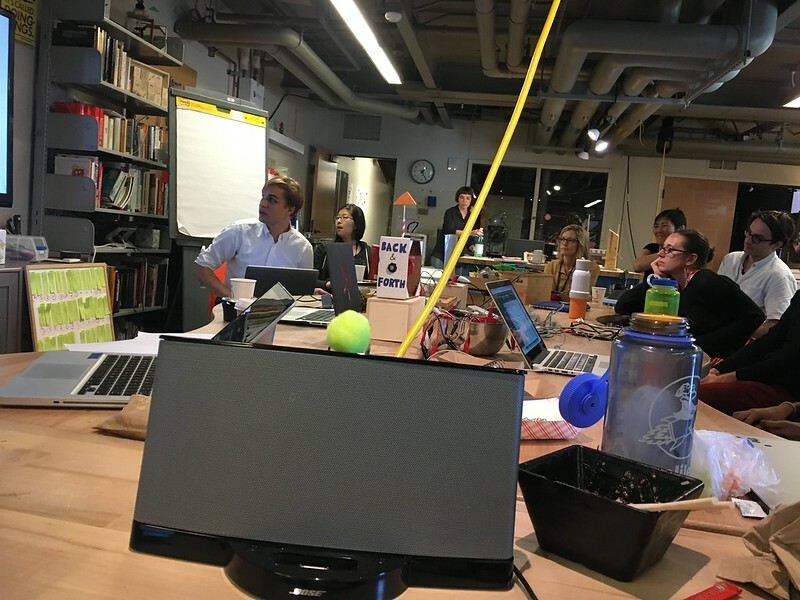 Last week, Nicole and I tried out a workshop we've been developing that we're dubbing "scratchpaper" for the first time as part of the Scratch conference at MIT. After the conference we were reflecting on the many paths we took to come up with the activity and spent a few minutes brainstorming a partial list of all the past experiments that influenced the development process and contributed to our thinking around the topic. As an exercise, I took the rough notes that we scribbled on an oversize post-it and tried to sort the ideas into categories related to the areas of exploration that make up the content of the activity. 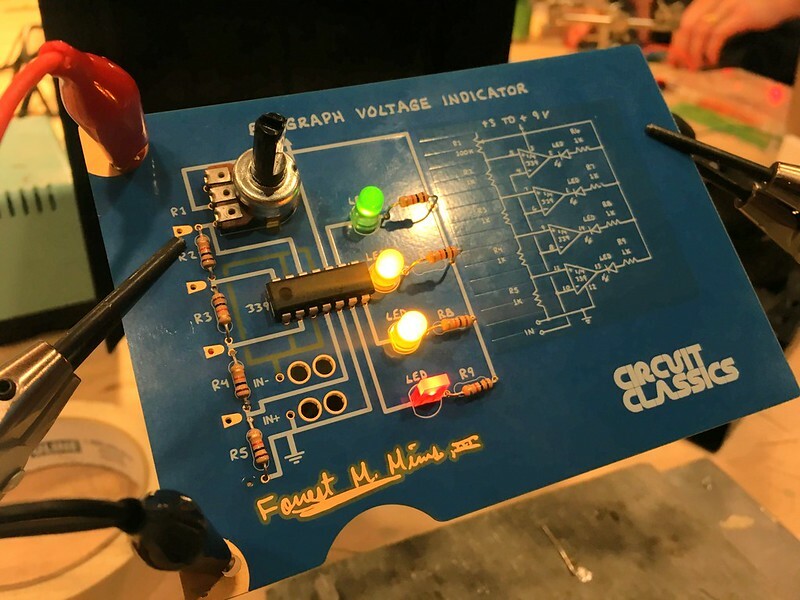 I grouped things related to paper circuits, scratch explorations, seeed studio grove kit, circuit blocks, programmed peepshows and sensor experiments. As well, I added relevant links to blog posts, videos, activity guides and sources for materials to the mindmap. 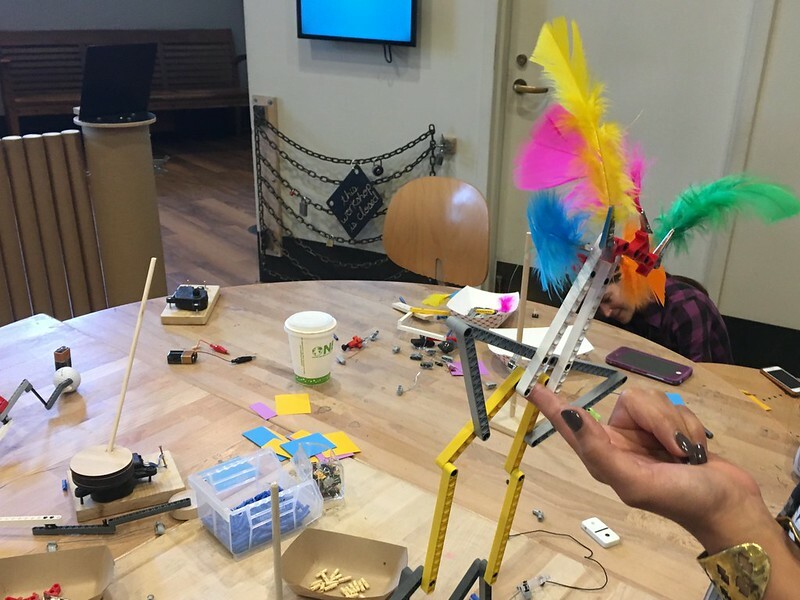 This represents a first attempt to try to capture the messy, non-linear, and collaborative process of activity design for us in the Tinkering Studio. Click on the image to get to the version with links added. I'd like to try something similar for other activities and it would be interesting to think about different ways to organize the inspirations on a timeline to emphasize how these explorations often take time to develop into fully fledged activities and how ideas complexity and combine with one another. We hope that the process will continue as scratchpaper becomes one more element in our growing ecosystem of playful inventions and delightful ideas.